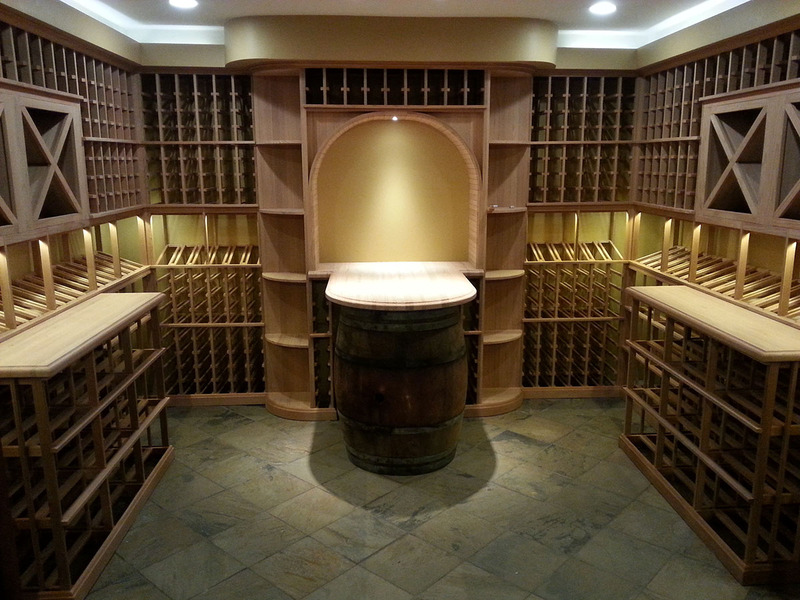 A straight forward design with cases below, bottles above and a buffed copper topped tasting table/peninsula was requested by this client who soon found his 1,600 bottle cellar full. At my last service visit we discussed expanding it. 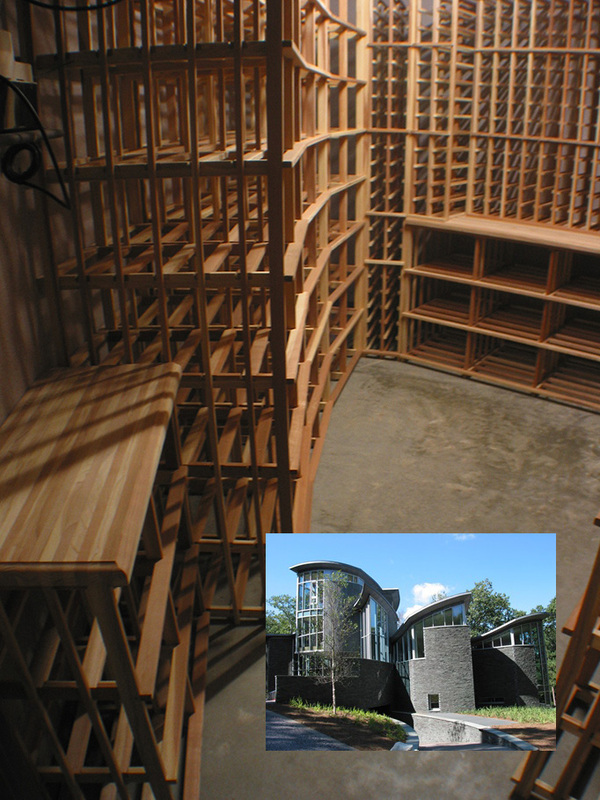 Design features: Mostly two bottle deep racks raised the capacity to 4,200 bottles in this Newton wine cellar. 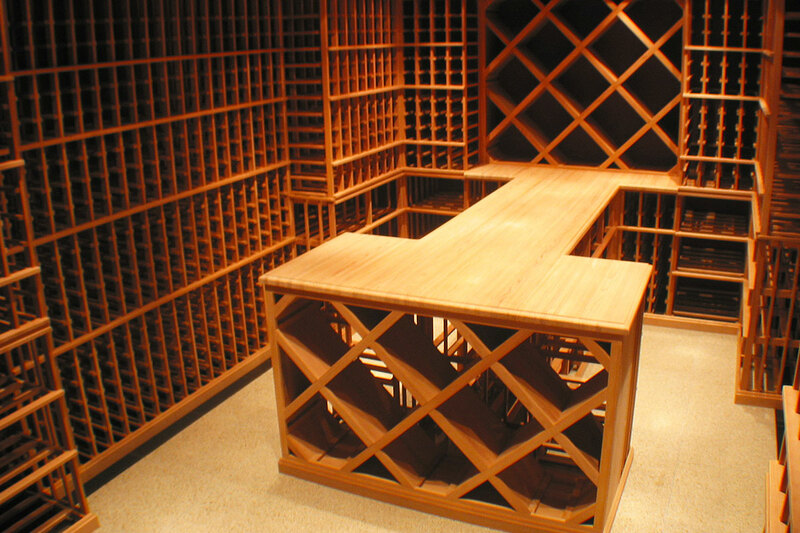 Lower level wood case bins and a “T” shaped copper counter table fronts the diamond bin rack. 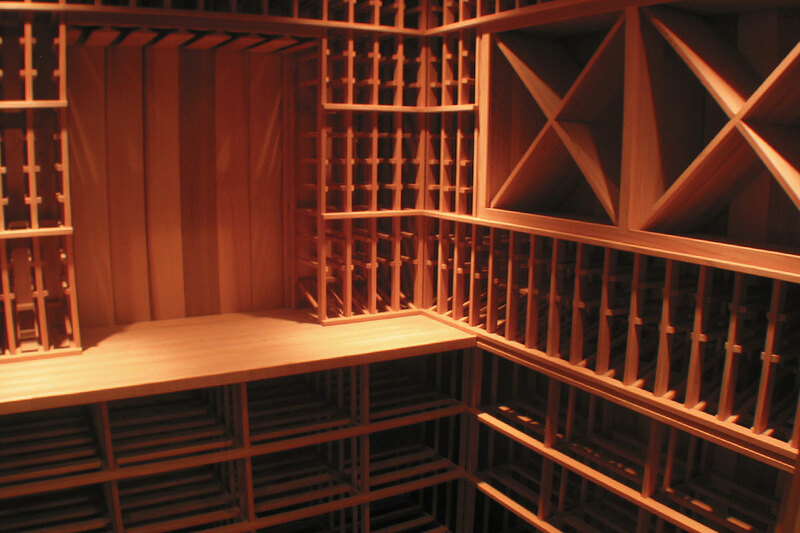 Unseen is a quiet climate system for temperture and humidity control. 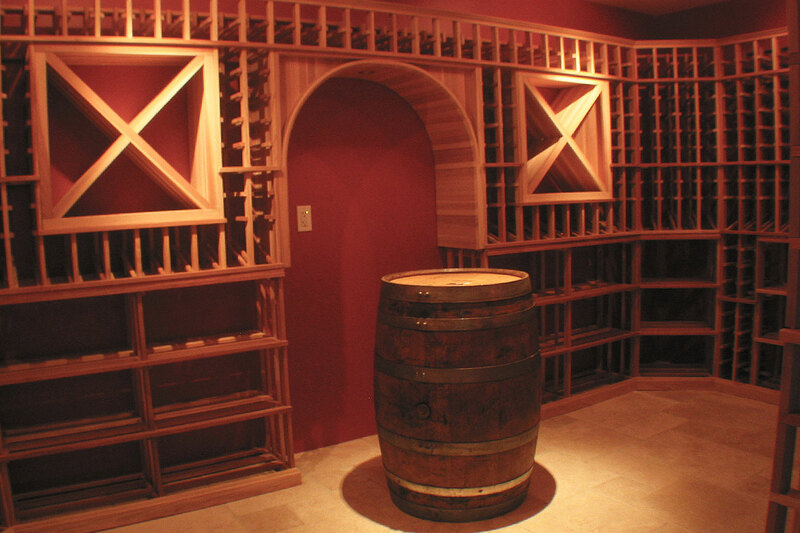 Exposed brick wall accents the lighted arch in this very stylish 2,500 bottle Newton wine cellar. 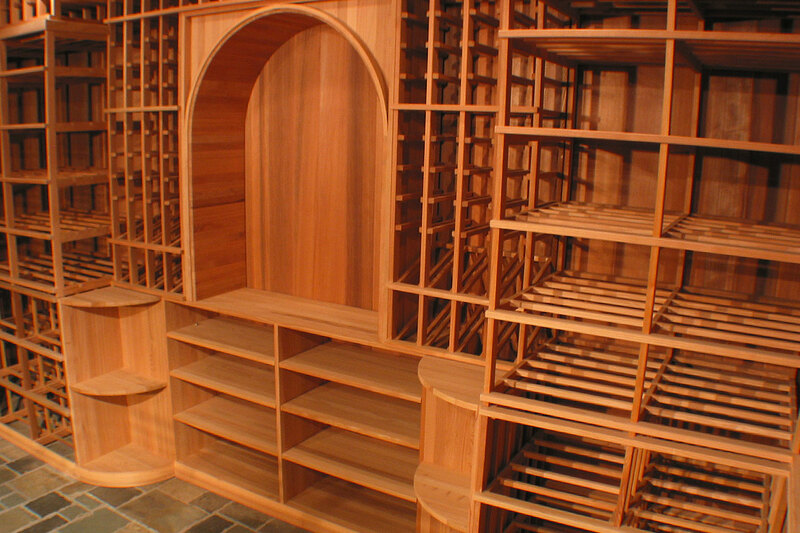 The redwood beadboard, pan ceiling, and chandelier details are enhanced by the curved corners and waterfall features in the wine racks. 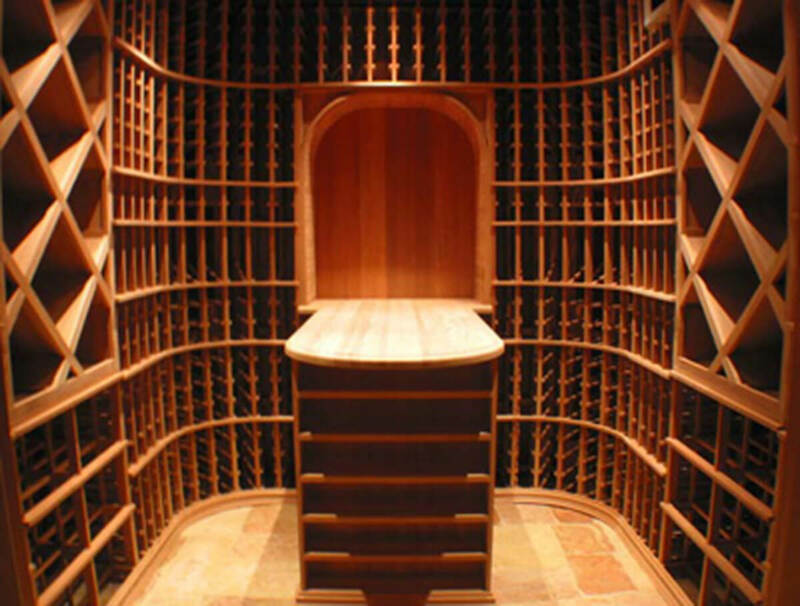 A fabulous wine cellar that was part of a complete restoration project in a century old English Tudor home. 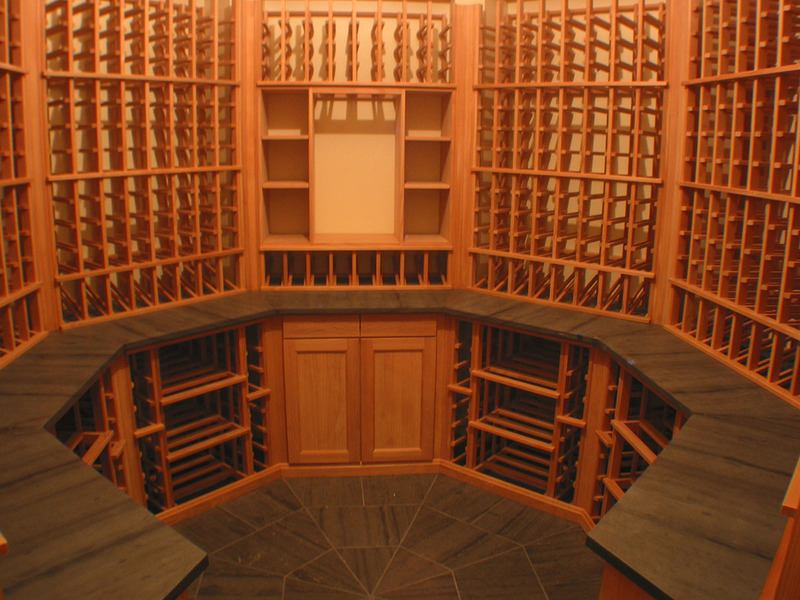 Designed and built for a Boston sports star’s new home, this elaborate redwood wine cellar features a walk through arch, two room design with plentiful display bottle spaces. 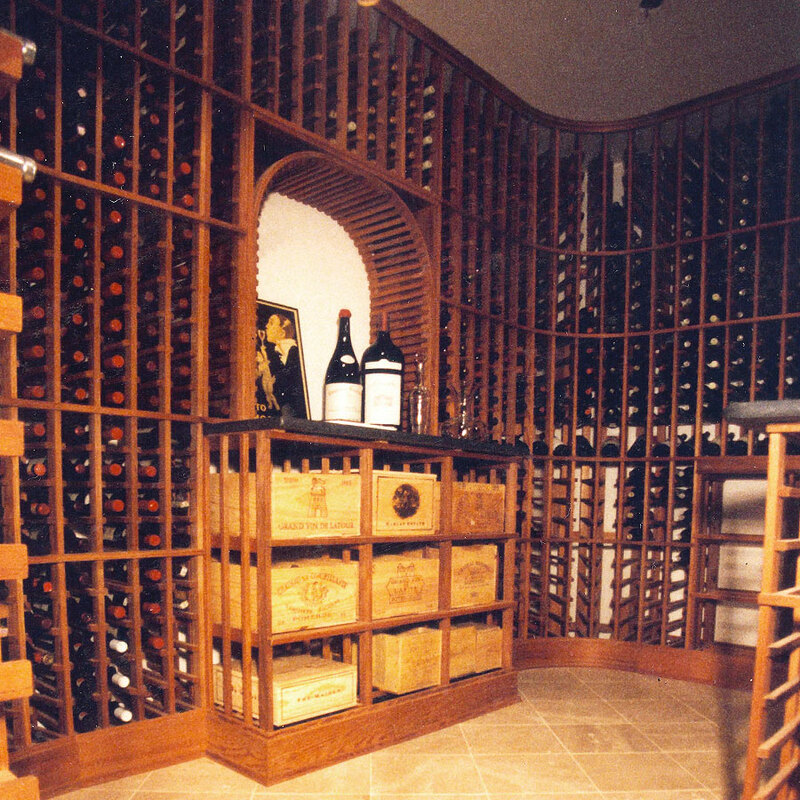 Curved granite counters accent the unique room shape holding 3,800 bottles. 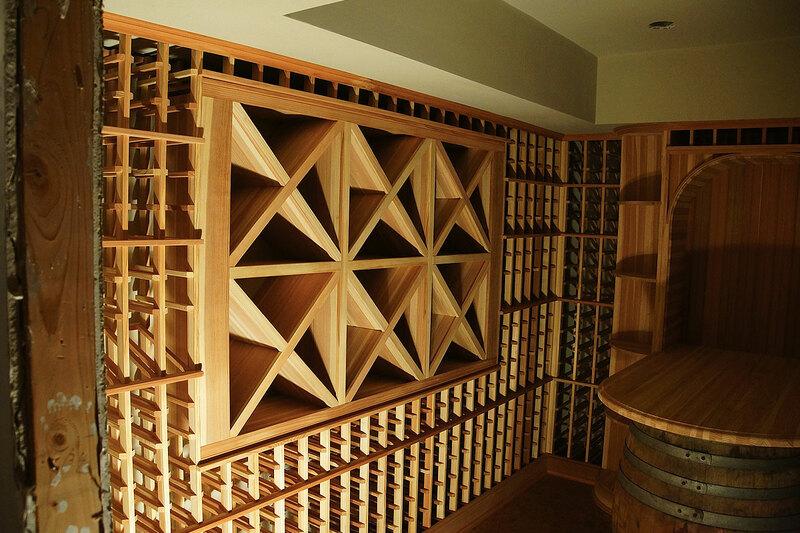 This 1200 bottle Concord design shows that carefully balanced shapes and dimensions can create a very pleasing wine cellar without undue complexty. 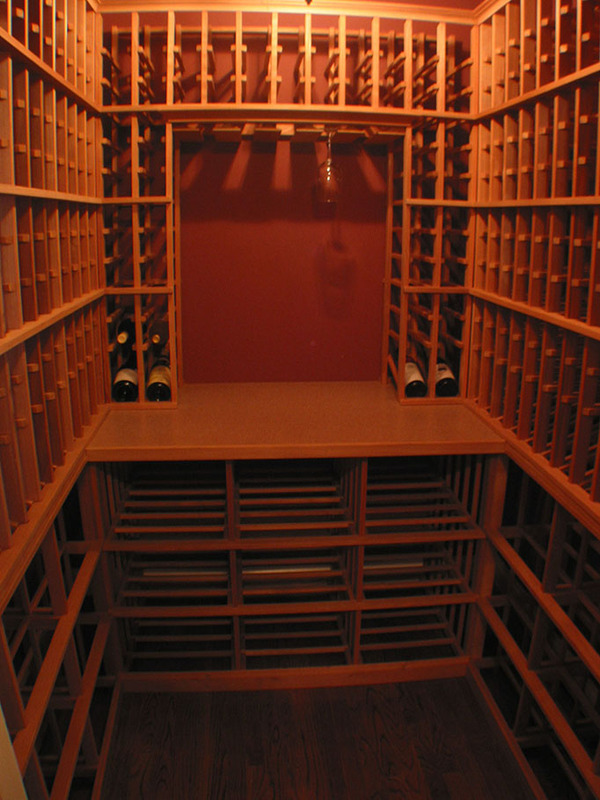 The racks above the counter are for hanging wine glasses. 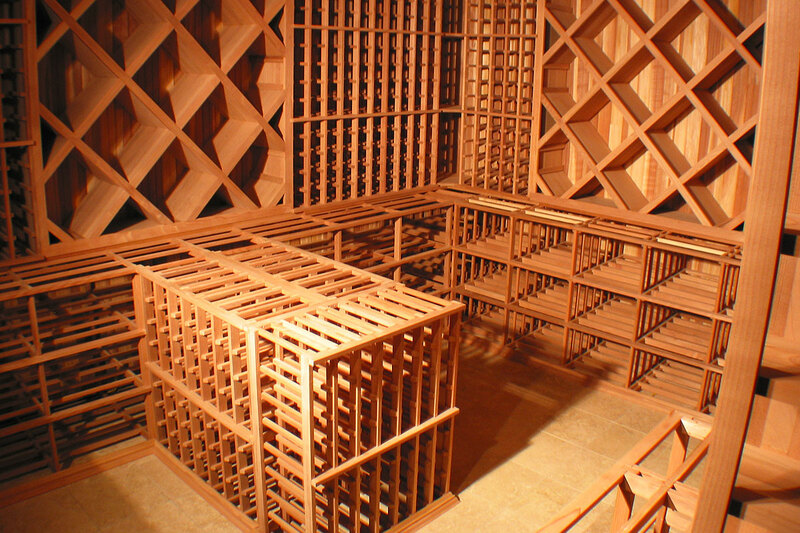 Below the redwood counter are case bin racks. 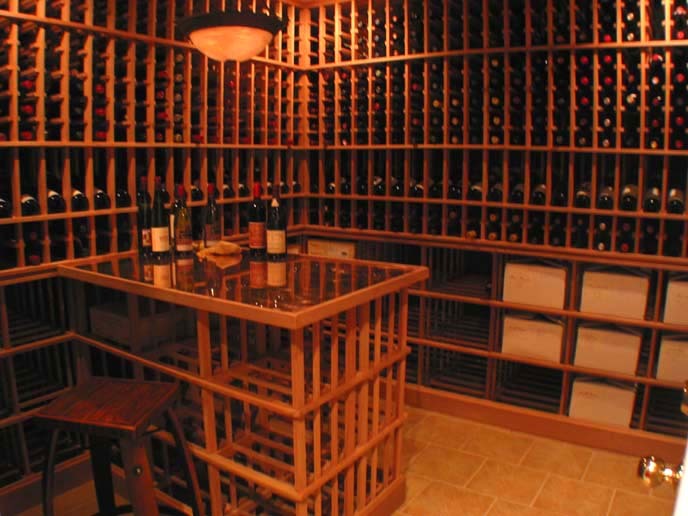 A 9,000 bottle capacity two room wine cellar on the Rhode Island shore includes racks for 10-liter and 5-liter bottles. 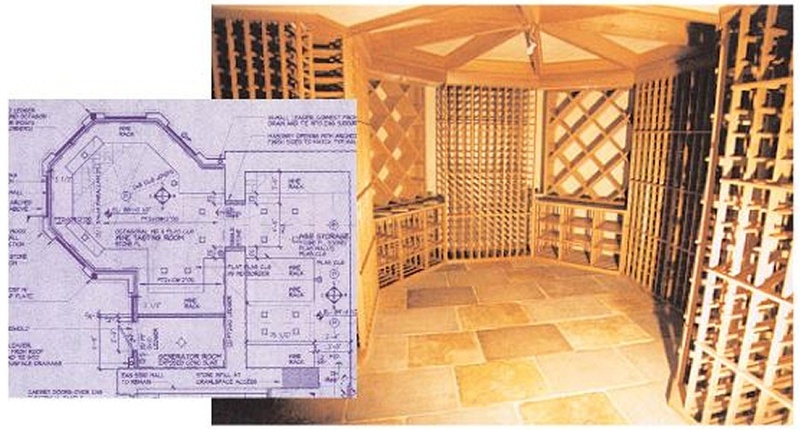 The unique octagonal design was the result of limited available space for the large capacity the owner required. 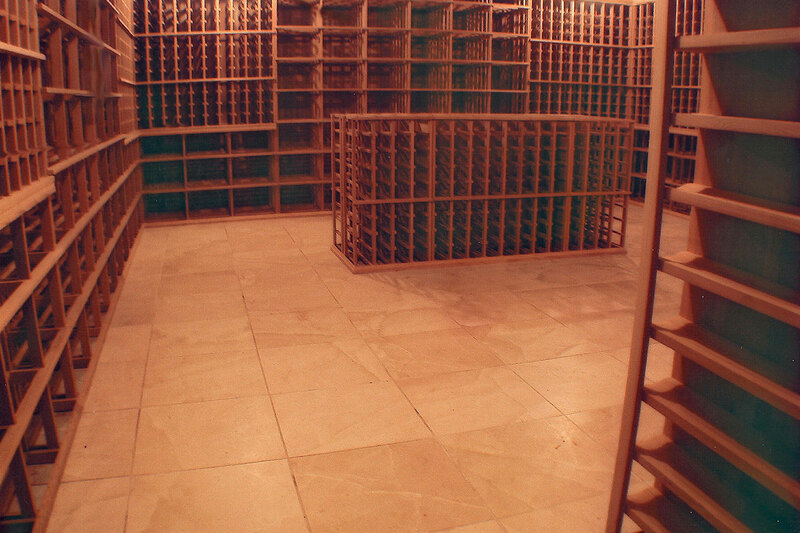 This 4,000 bottle cellar in Needham appeared in a Boston Magazine Home and Garden issue. 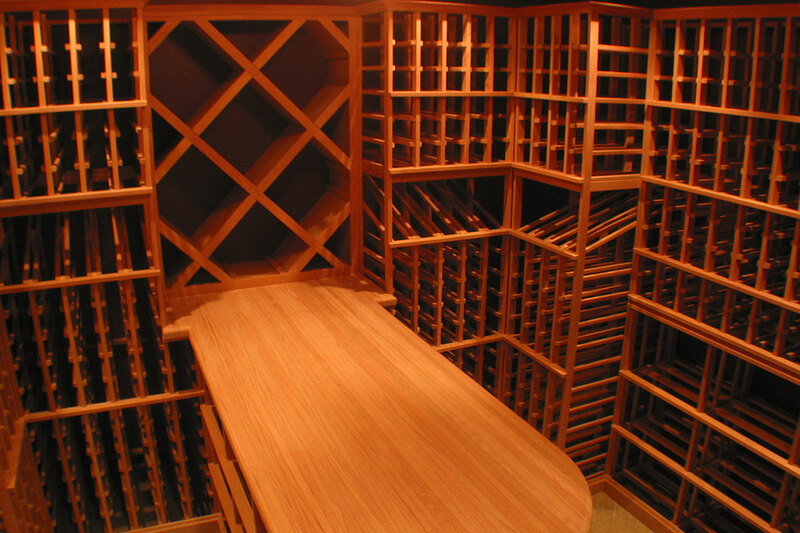 Solid redwood planking is used in the ceiling and walls, excluding any paint in the pure, humidity and temperature controlled atmosphere. 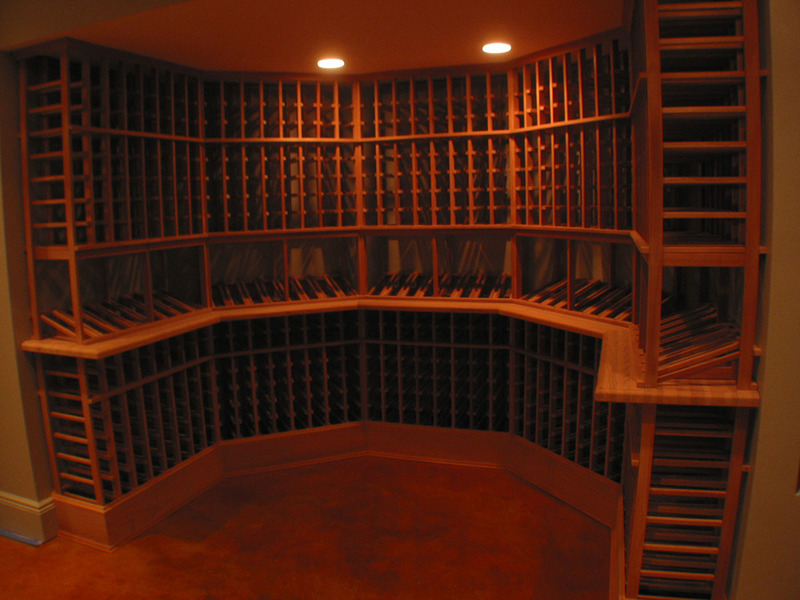 Notice the cellar is full; 2000 was a very good year. 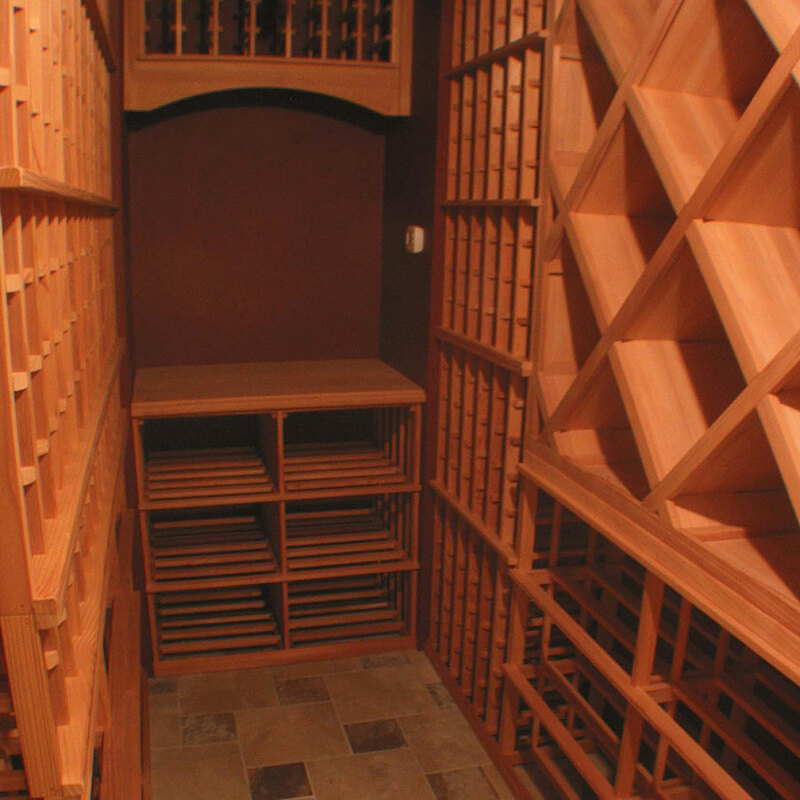 Dramatic stone arches with racks inside and pillars on a radius layout create the cave like feel of this 1,400 bottle Lexington cellar. 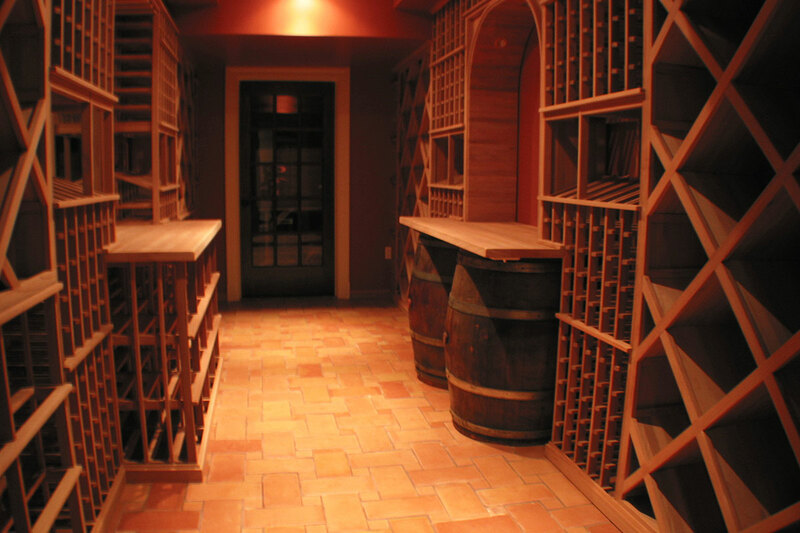 Built into a hallway, this long narrow Weston cellar features floor to ceiling diamond bins, numerous display bottle areas and a very unique pair of oak wine aging barrels to support one of the redwood counters. 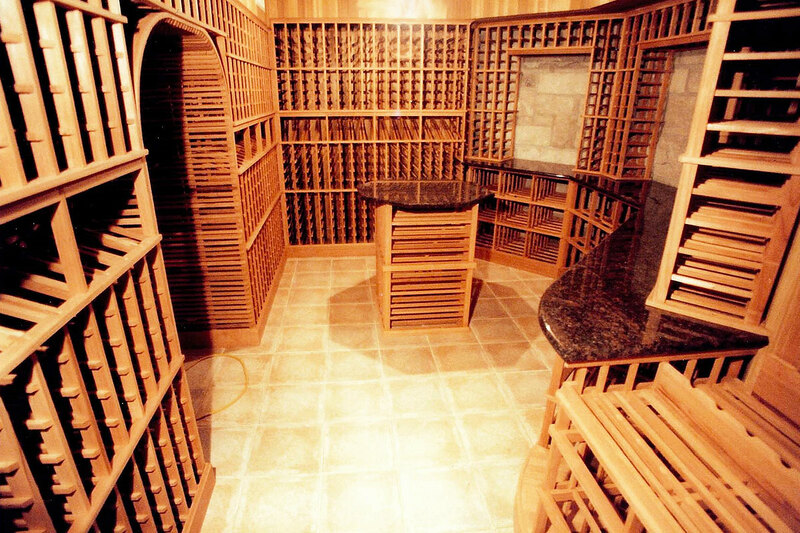 This art collector wanted to place sculptures and paintings in his wine racks and cabinets. He asked for something unique and different, giving the designer a free hand. 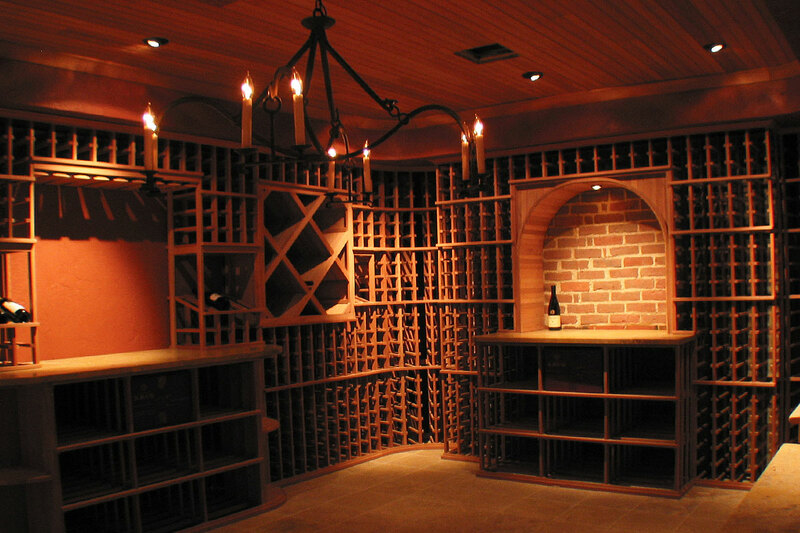 Extensive use of curved surfaces and moldings are nicely contrasted by the brick walls. 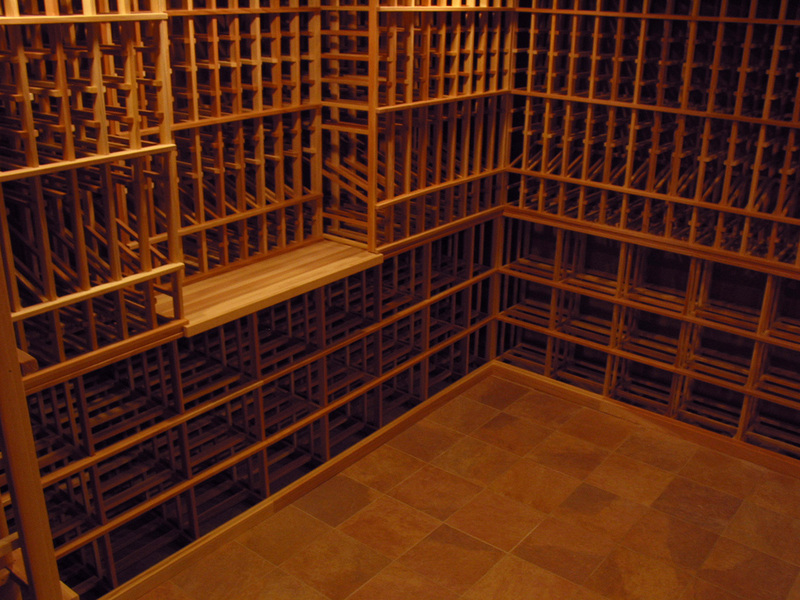 An irregularly shaped room in the basement of an old Brookline house required the rack design to ramble a bit. 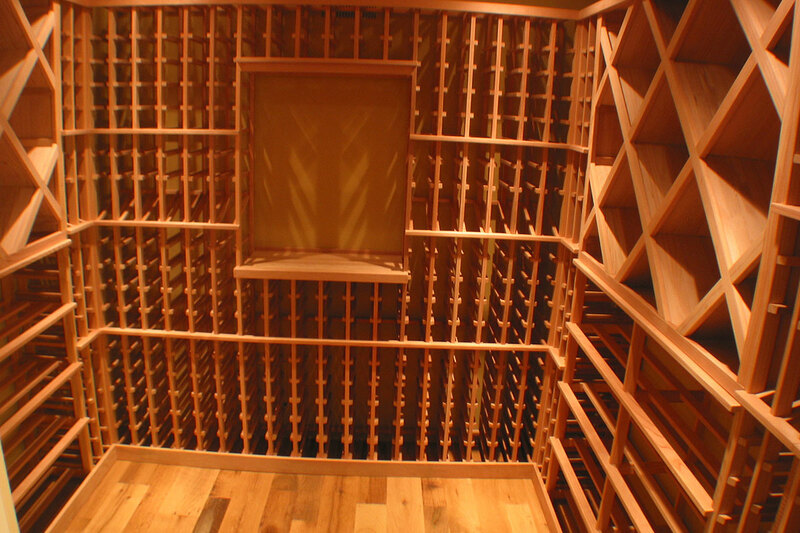 The view is from a walk through entry arch of wine racks. 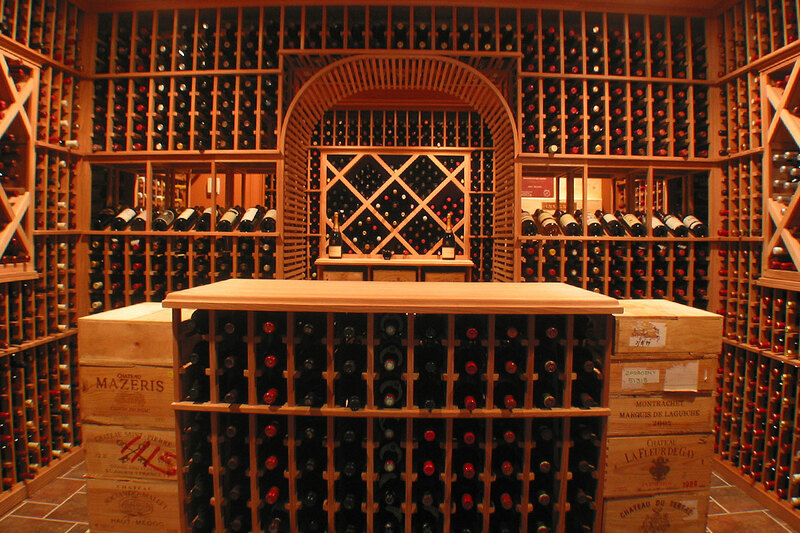 The racks wrap around a large boulder outcropping that added to the cavelike feel of this full, 2,400 bottle cellar. 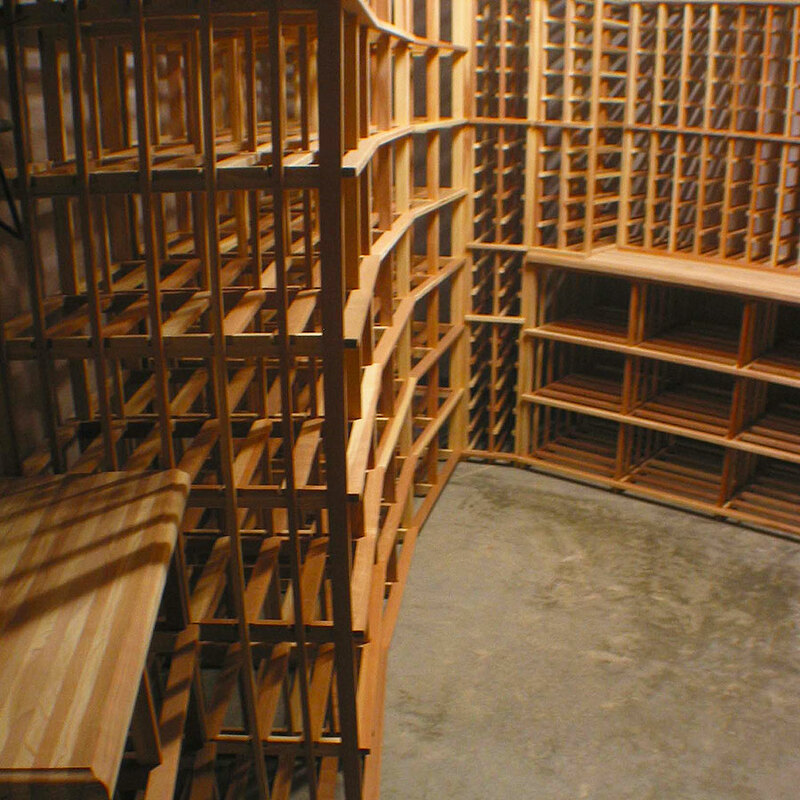 A walk through arch in the partition of wine racks defines this wine cellar of over 4,000 bottles was filled on the first day of completion. 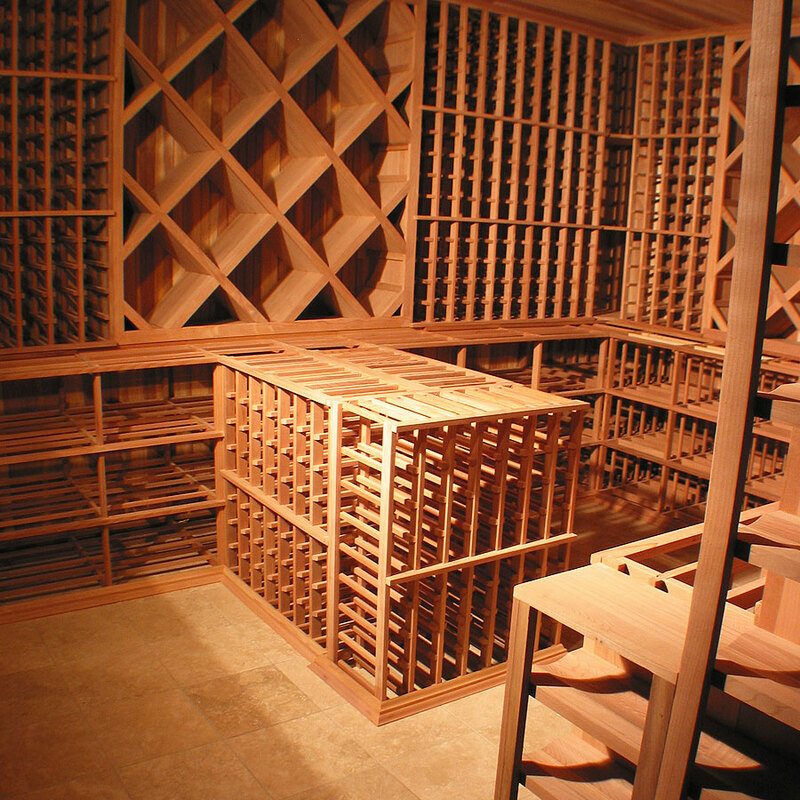 The redwood tasting table is unfortunately flanked by stacks of wood cases. Bill’s notorious summer parties should help make room for new aquisitions. 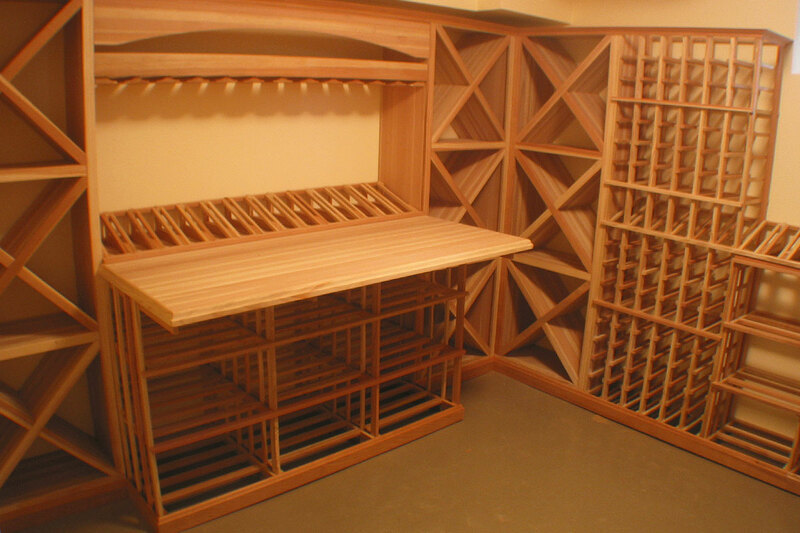 Diamond bins center this Weston design above and below the “I” shaped redwood counter. 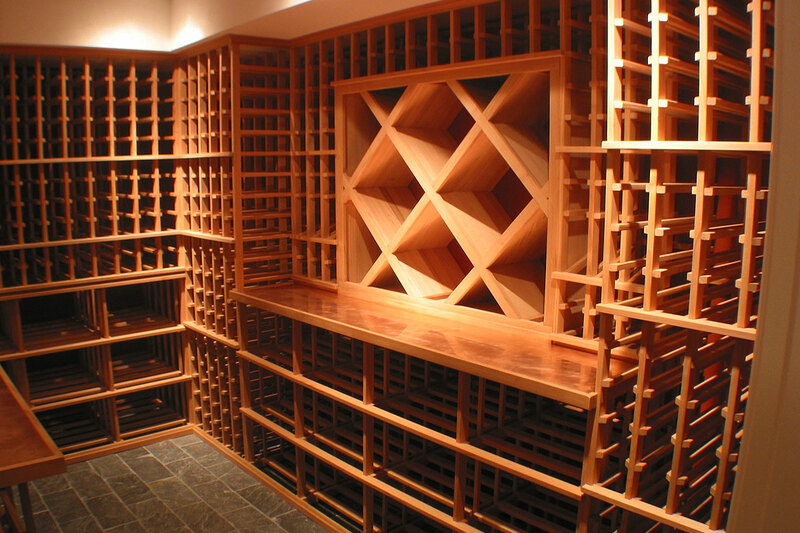 In this generous space an ample capacity of mostly individual bottles are accented by numerous depth changes in the corners adding depth and visual interest. 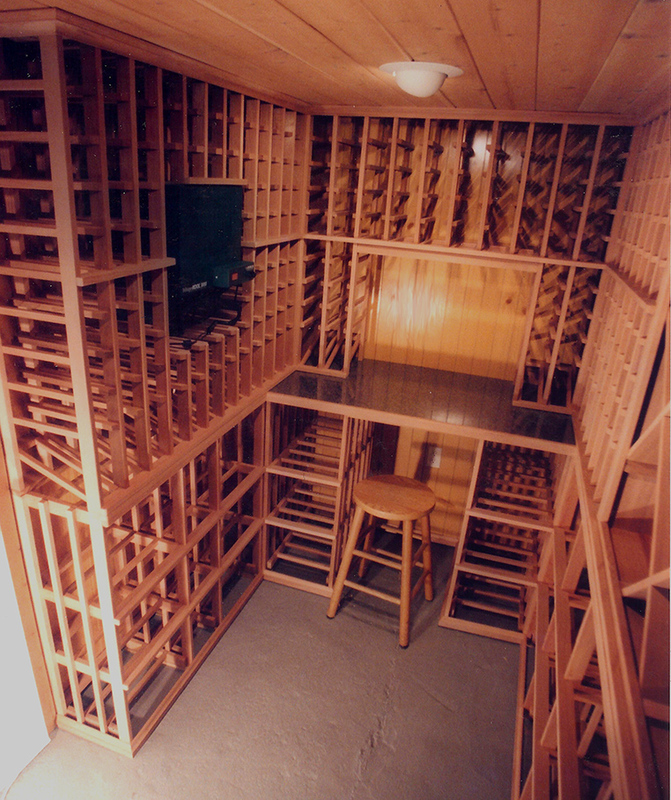 An excellent use of small space, this 6′ x 10′ room has capacity for 1,100 bottles and features redwood racks and a cedar ceiling. 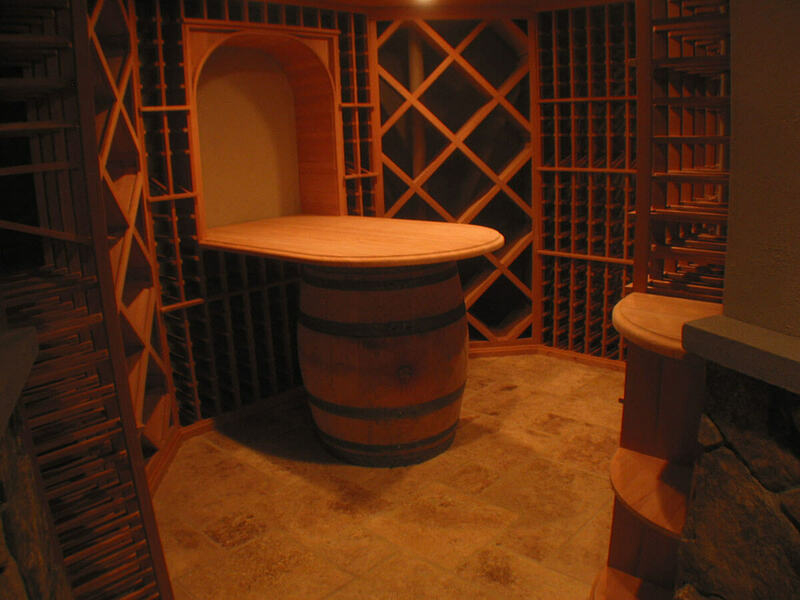 A built-in desktop provides work space for the oenophile professor to use his lap-top computer for his wine cellar management software. 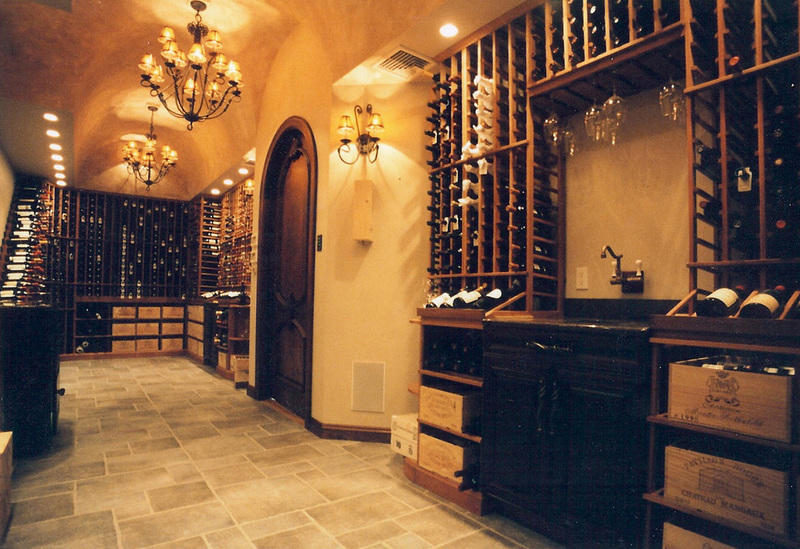 A barrel vaulted ceiling and arched entry define this highly styled cellar. 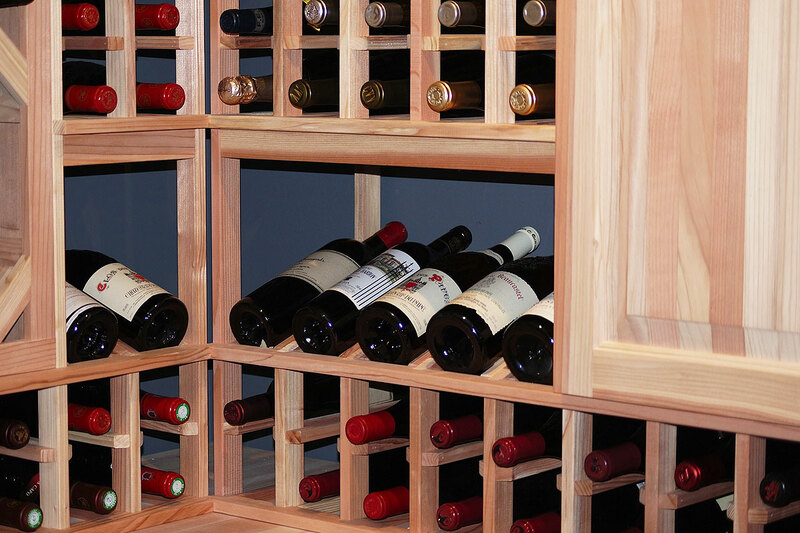 A hanging stemware rack over the sink, a waterfall display, counter level display bottles, and lower tier case bins are the prominent racking features. 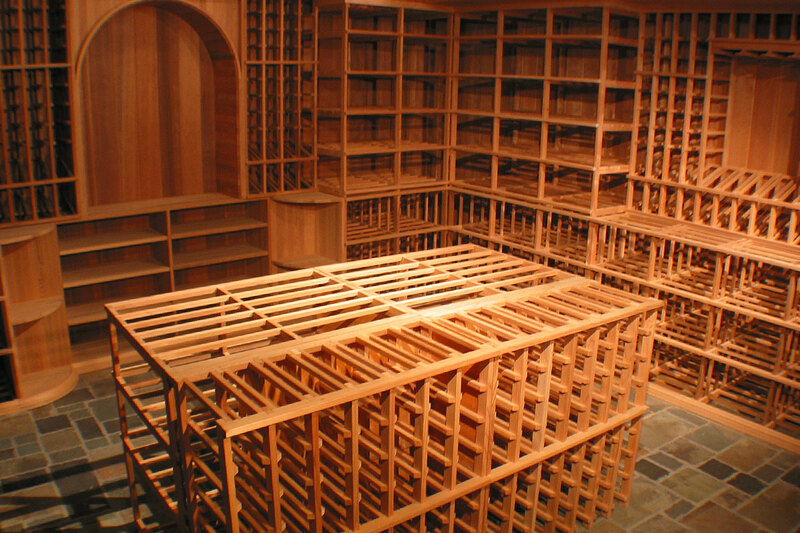 An Octagonal room encloses a surround of wine racks on Martha’s Vineyard. 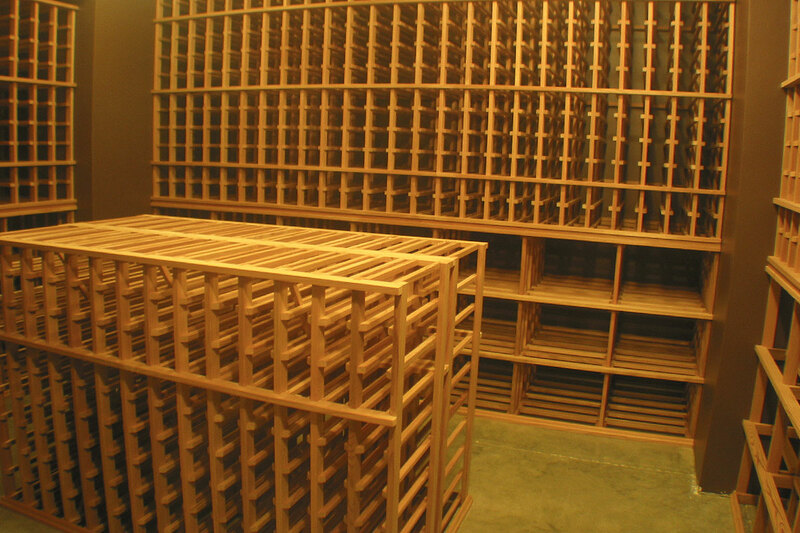 A storage cabinet with drawers and niches for art objects and large bottles is flanked by display rows and wood case bins below. A surround of blue slate countertop compliments the matching floor tile. 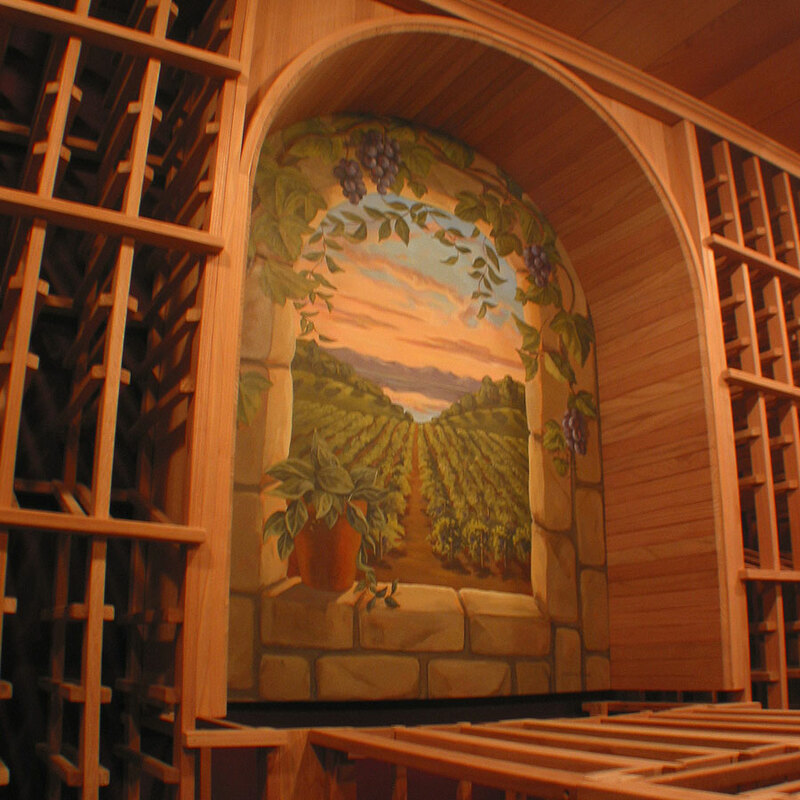 Floor to ceiling diamond bins frame a Dyrick Schaefer original oil on canvas vineyard scene under the arch. The large bin racks are canted in to further enhnace the artwoork. 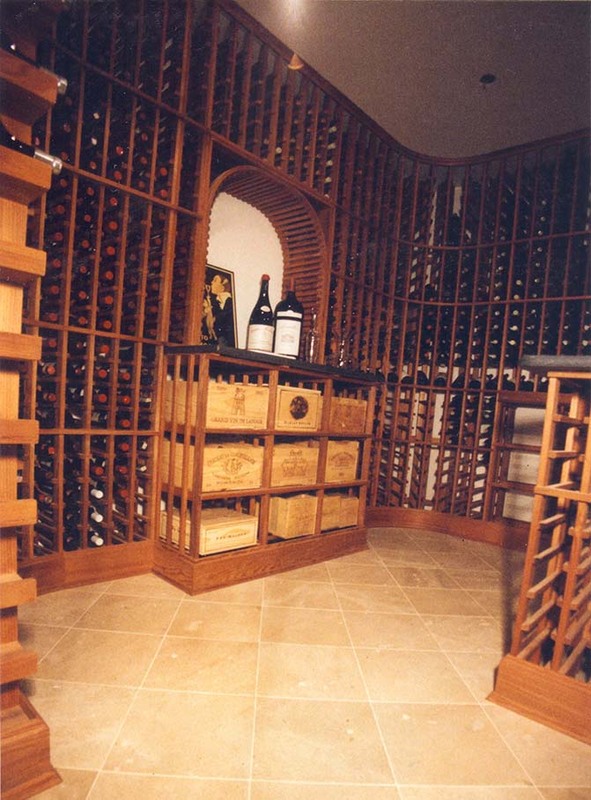 Granite counters on three walls and honed stone tiles are quality additions to this showcase wine cellar in a new Weston home. 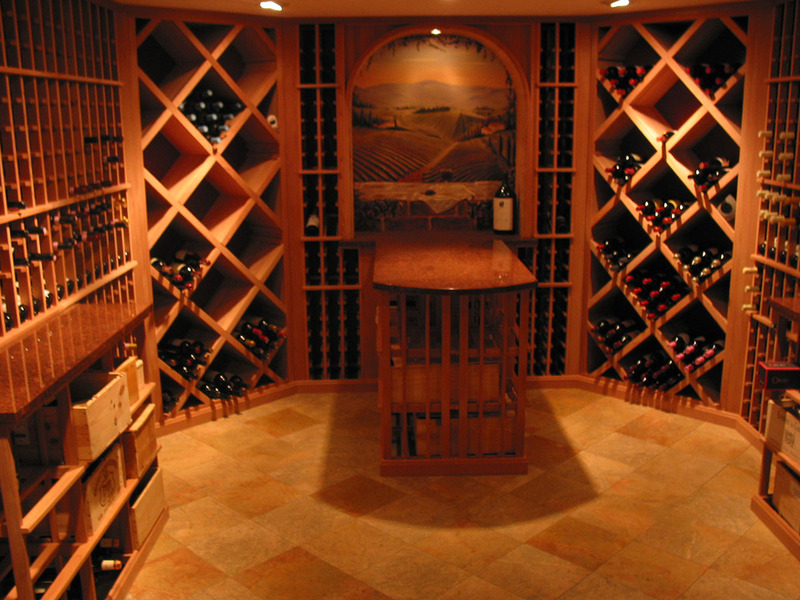 Not all cellars are large or complex designs. 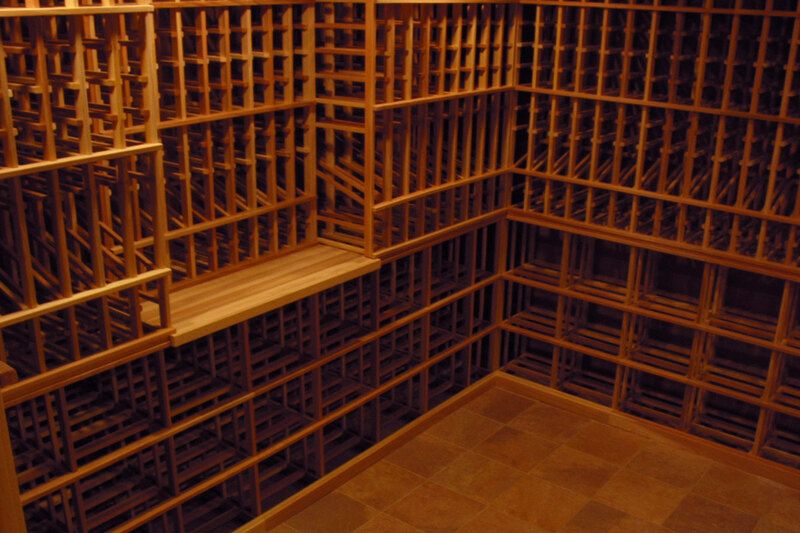 This restaurant owner’s personal cellar had to fit a small space on his home’s main floor but still holds 800 bottles with room for 9 wood cases, all maintained at 55 degrees. 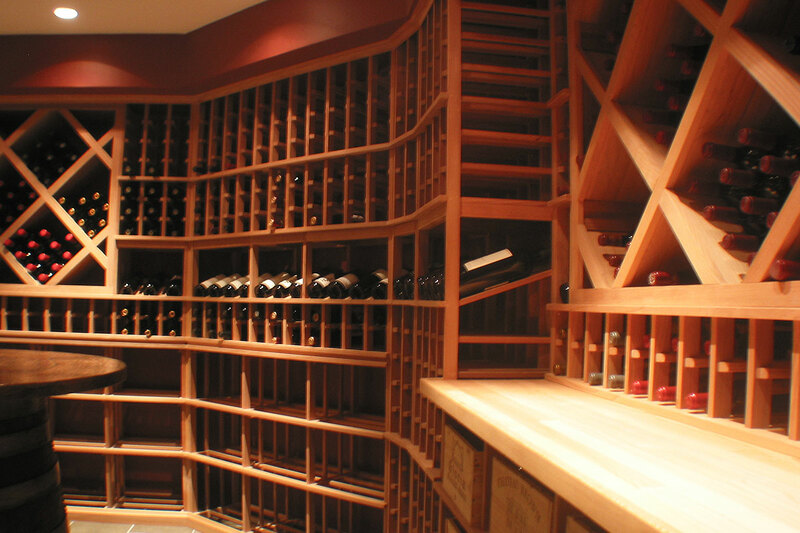 A curved soffit and curved shelves with indirect valence lighting accents the curved counter and barrel radius in this 1,600 bottle Lexington wine cellar. 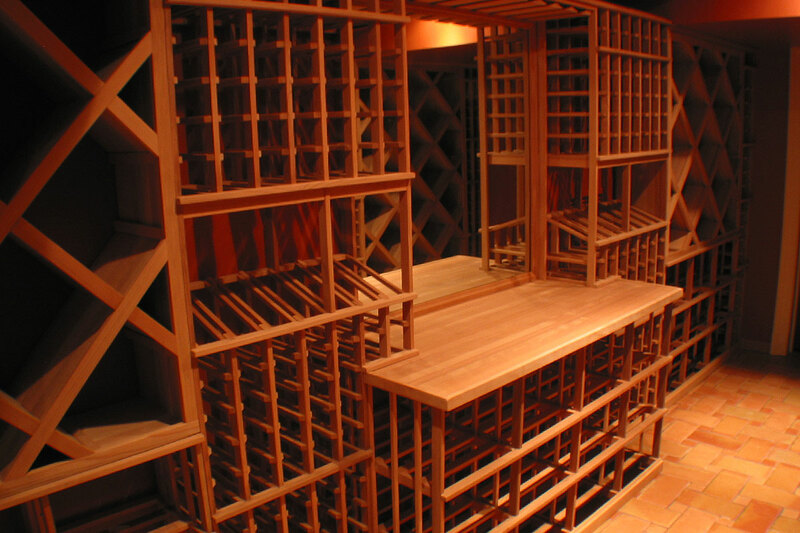 The redwood wine racks have open display rows with accent lighting for a dramatic effect. 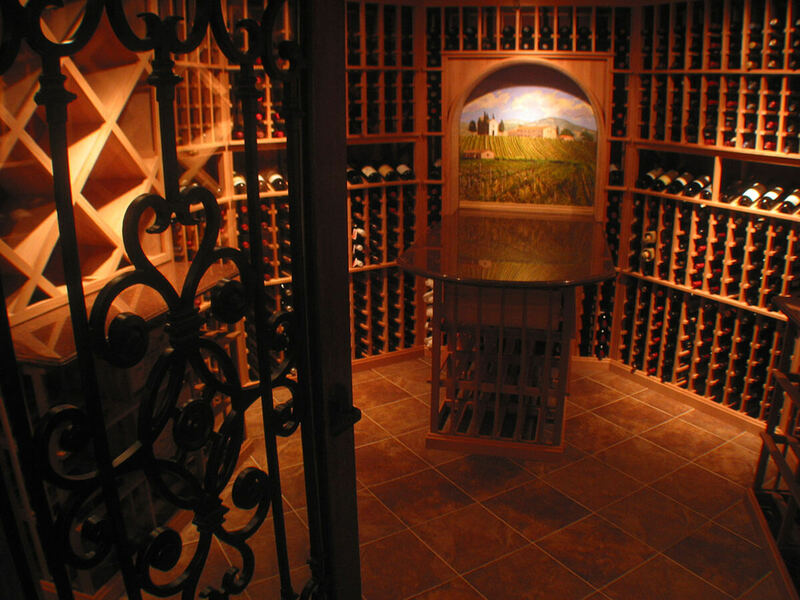 A wrought iron and glass mahogany door is the dramatic entry to this elegant wine cellar with granite countertops and an original oil on canvas vineyard scene framed by the redwood arch. 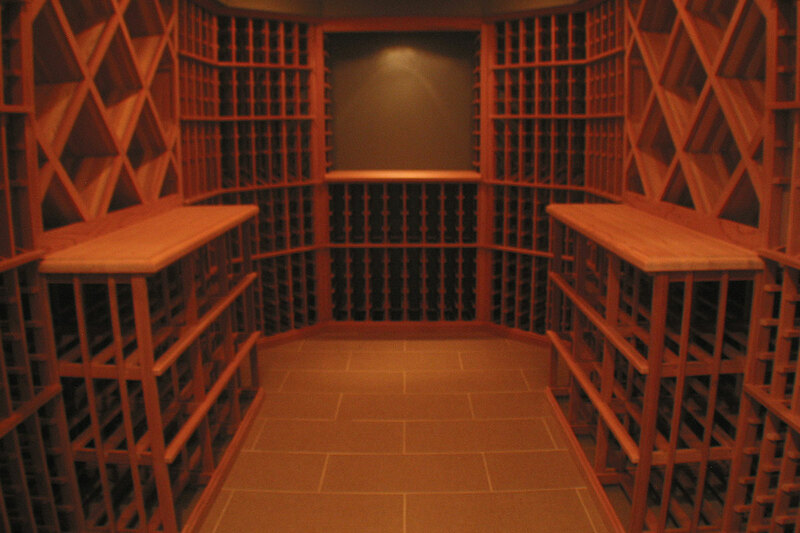 Stone wainscoting was used in the entry hall of this Hingham wine cellar. 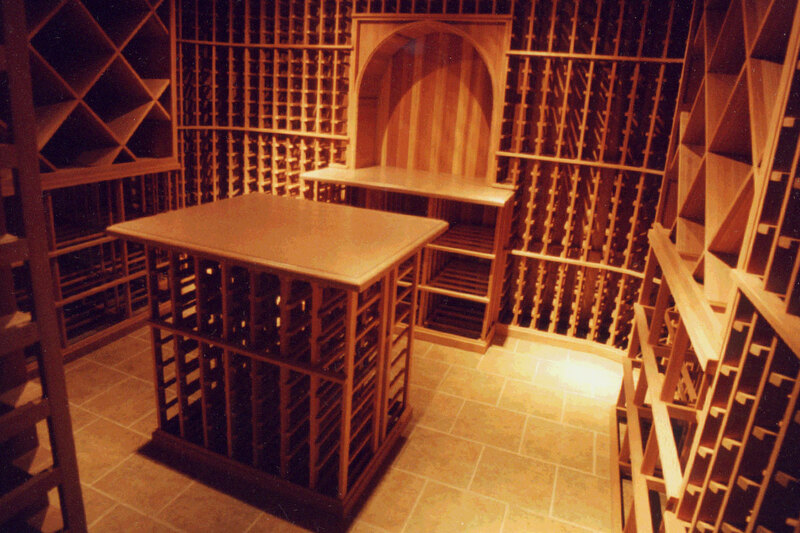 A speak easy mahogany door added to cavern feel. 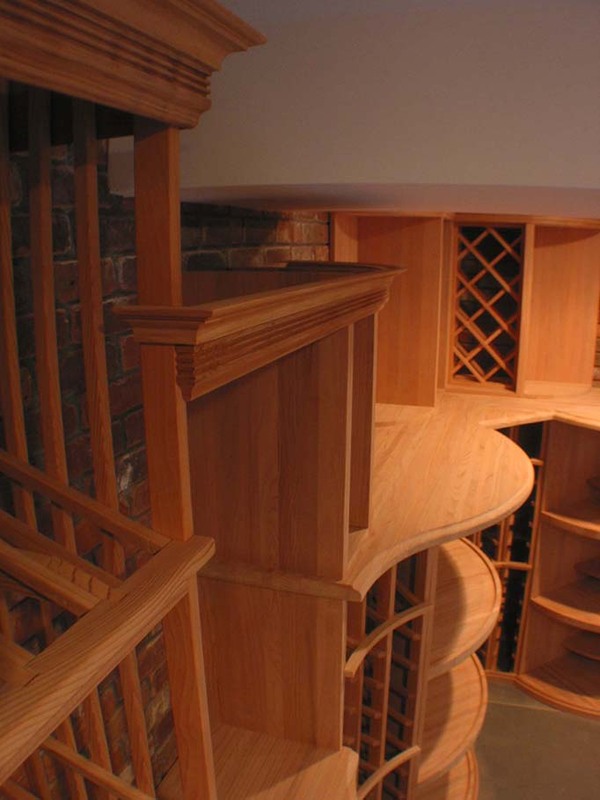 True radius curved corner wine racks with curved base and crown moldings create a dramatic look in a modestly sized 1,110 bottle wine cellar in Dover. 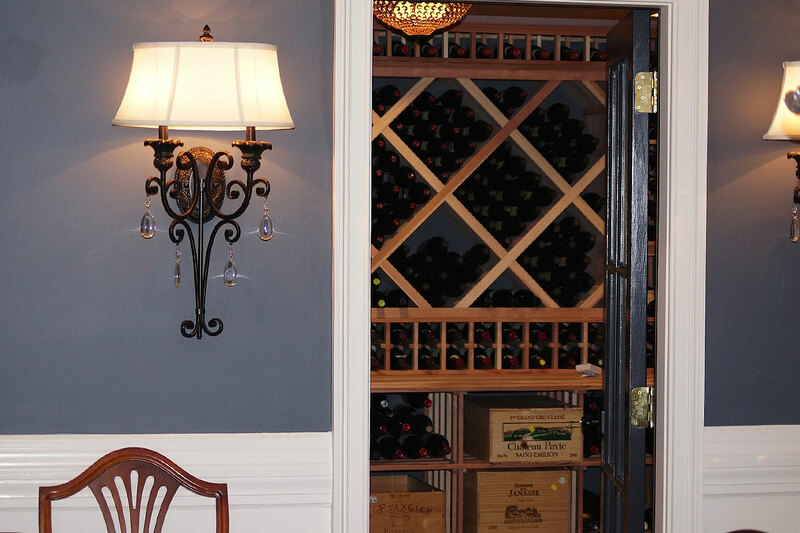 Built for one of Boston’s favorite pro athletes, this wine cellar is next to the trophy room. 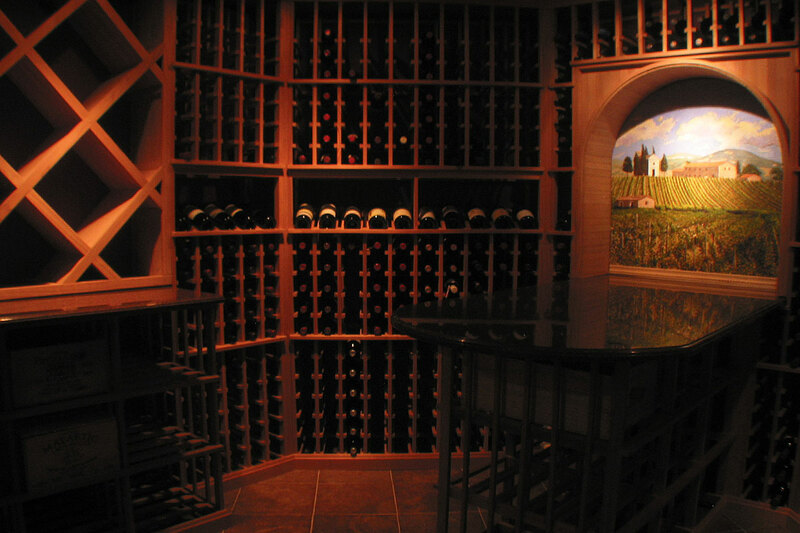 The granite countertops, walk through wine racks arch, free standing wine rack tasting table, and stone walls are only a few of the features of this 3,500 bottle wine cellar. 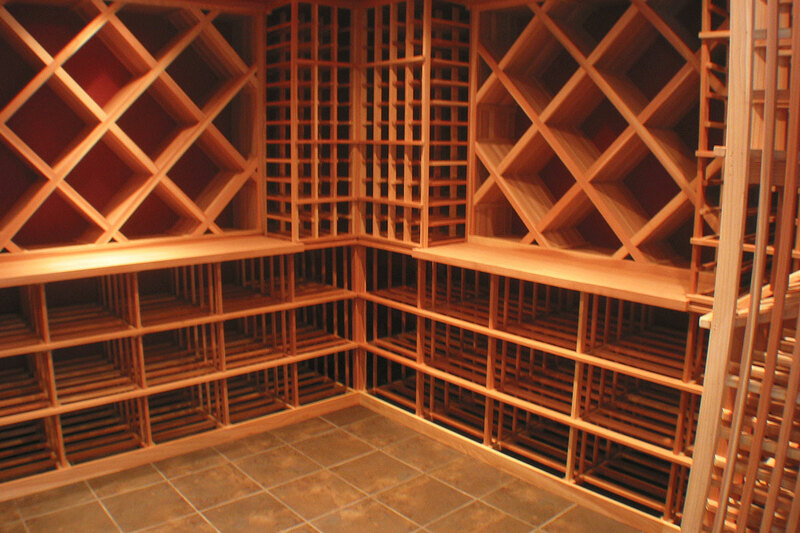 Some wine cellars are simply about storage and proper wine cellar climate control. 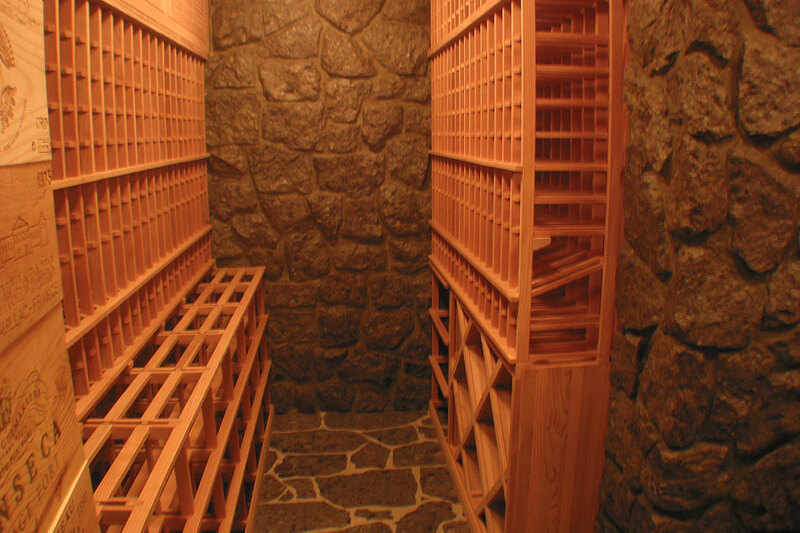 Stone walls provide a cavern like feel to this Chestnut Hill wine cellar, awaiting the stone countertop installation in this photo. 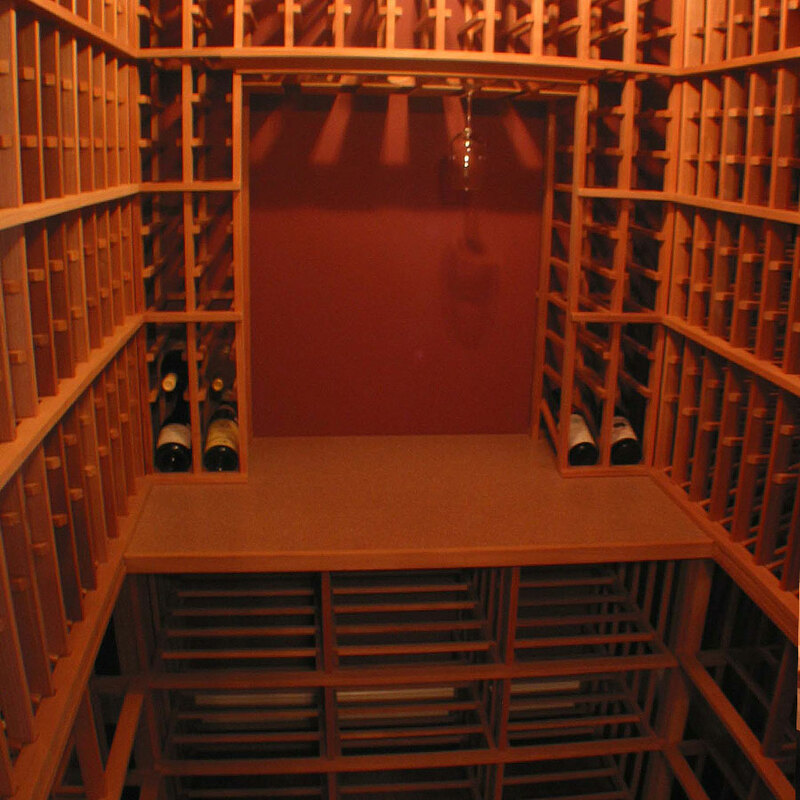 Moderately sized wine cellars can be elegant when the wine racks’ elements are balanced, in proportion, and fit seamlessly. 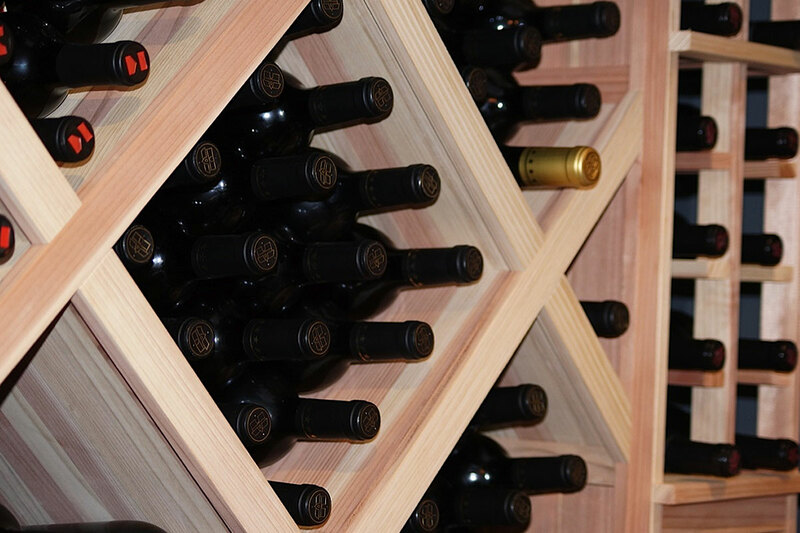 Not immediately apparent, two bottle deep storage around the entire cellar provides high density, high capacity, 3,200 bottle storage in a moderately sized room. 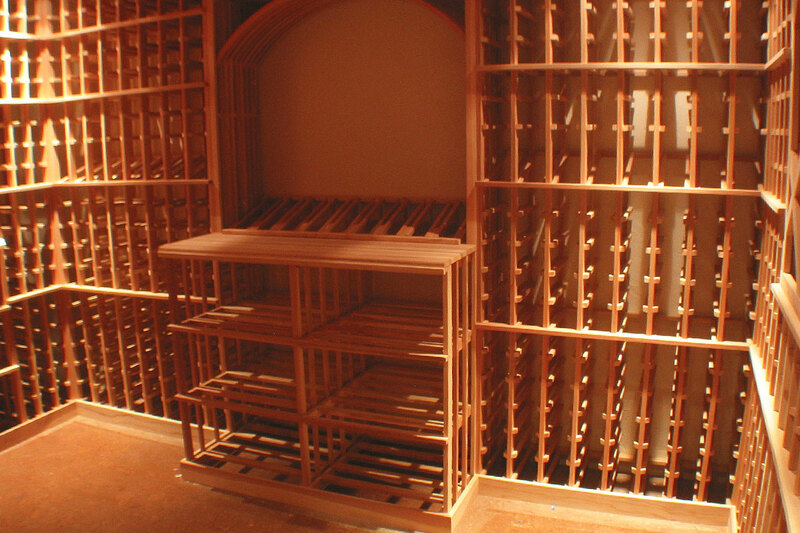 Two bottle deep storage allows a 4,000 bottle capacity in a 12’ by 12’ wine cellar. 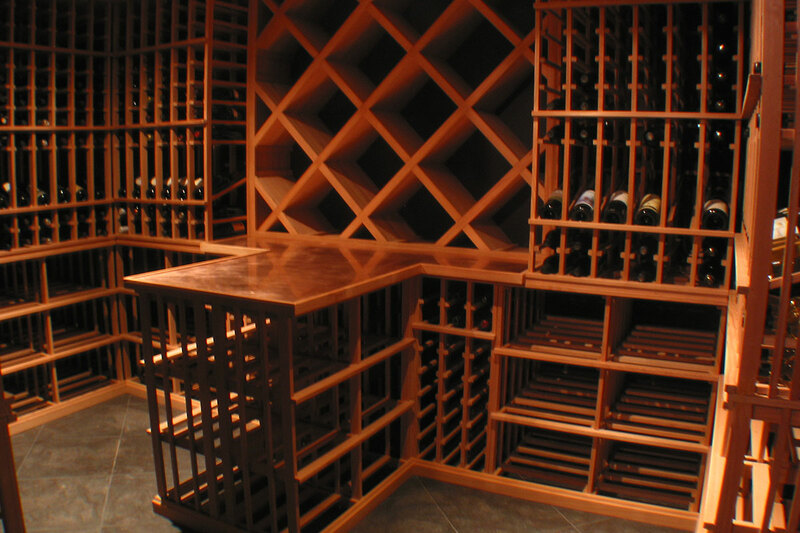 Wine racks tucked under a perimeter soffit feature a copper countertop which achieves a rich patina with age. 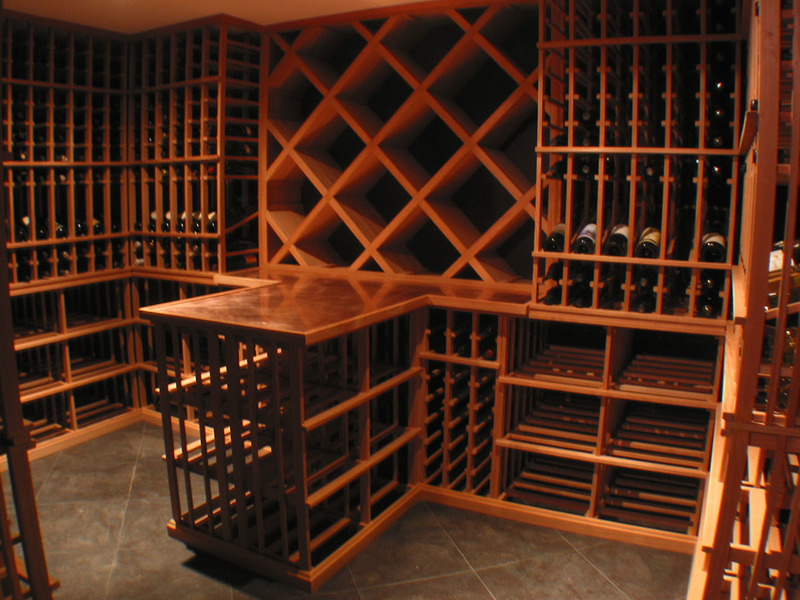 Redwood, copper, slate and Dom P, a nice combination. 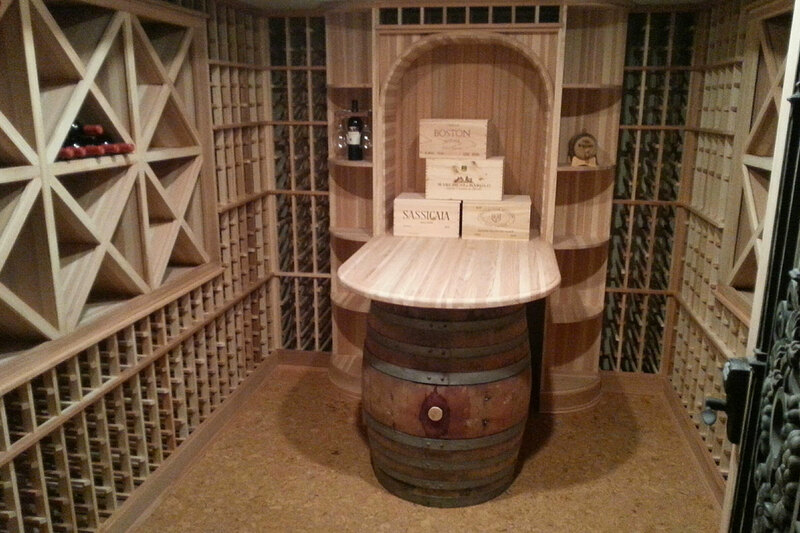 A solid redwood countertop and two bottle deep display bottle corners add depth to this wine cellar. 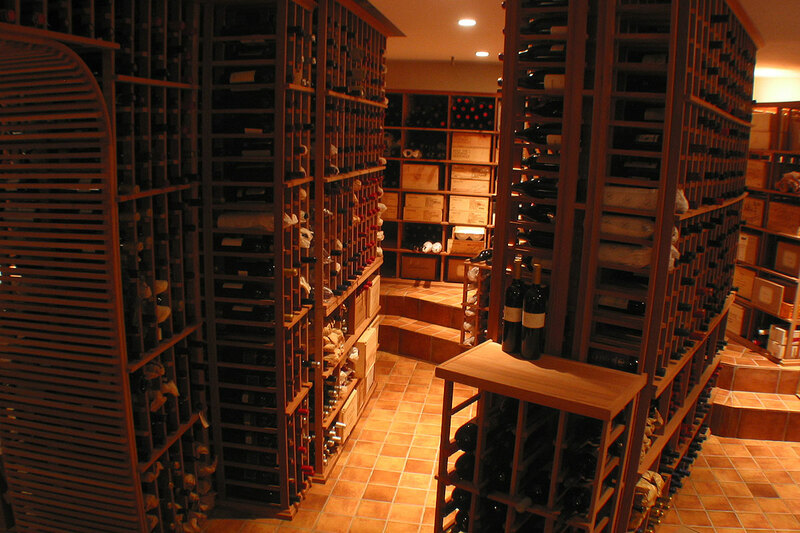 The basement of an older Chestnut Hill home had multiple levels and protruding boulders, the wine racks wind around the room as possible in an interesting random manner. 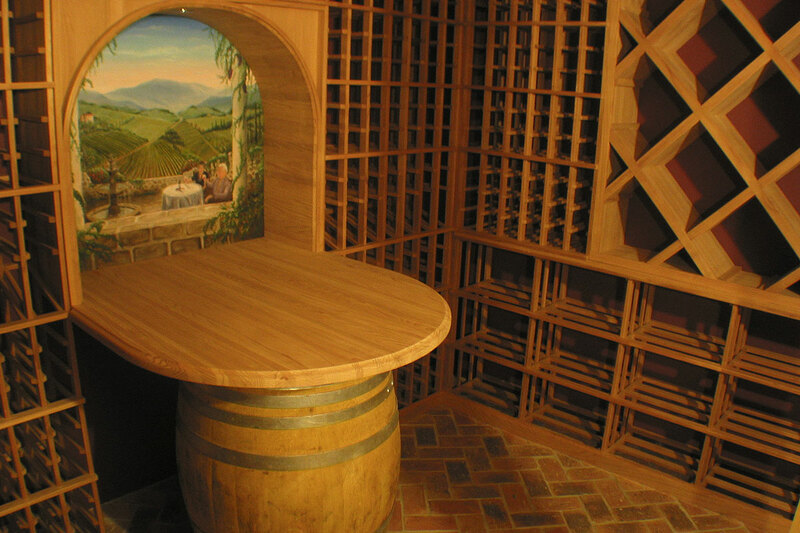 The stone countertop was yet to be installed atop the oak wine barrel. 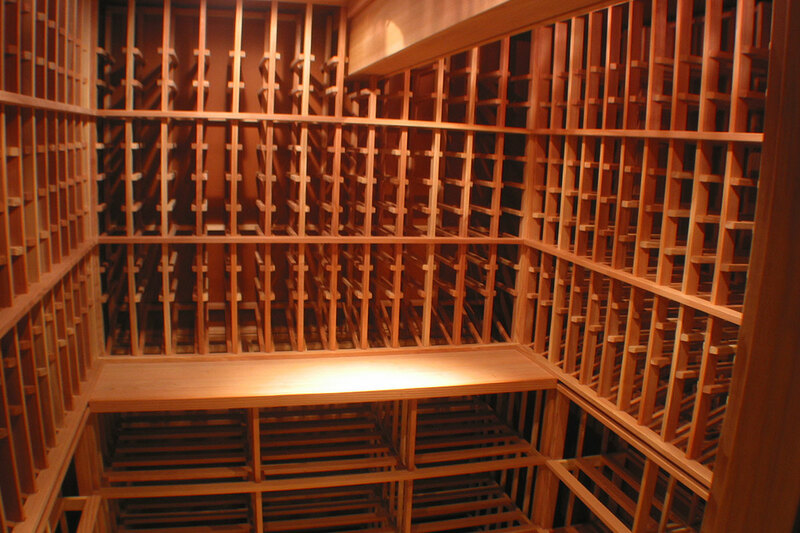 Proper storage and capacity were the main objectives of this Chilmark wine cellar in the basement of a garage. 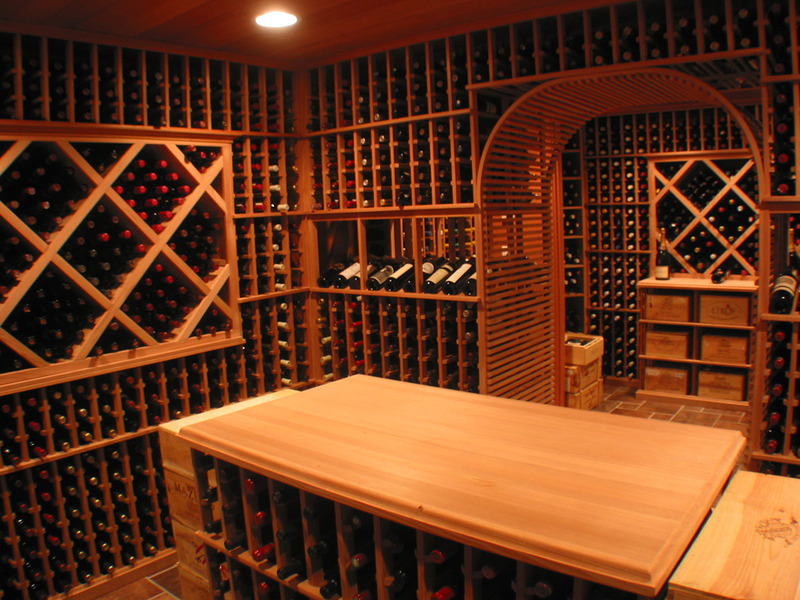 With solid redwood walls and ceiling no paint finishes influenced the atmosphere of this oenophile’s wine cellar. 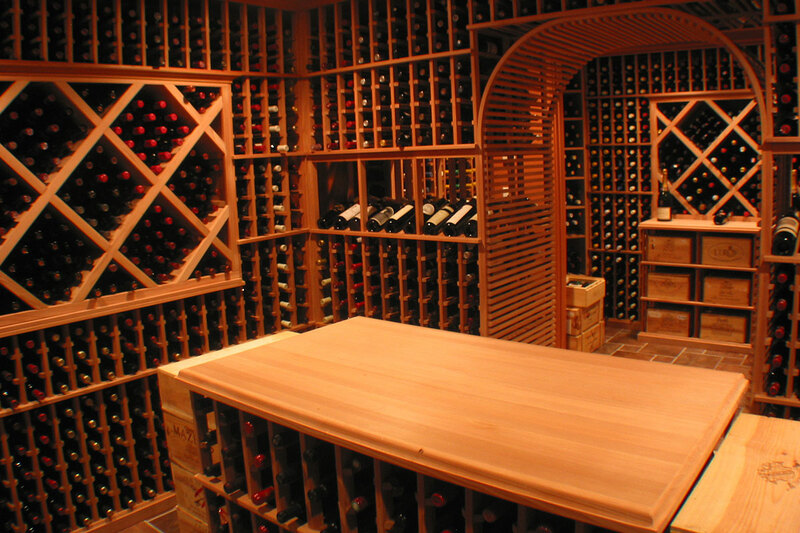 Negotiating a beam in a 1,000 bottle wine cellar. Straight forward design was the customer’s request. 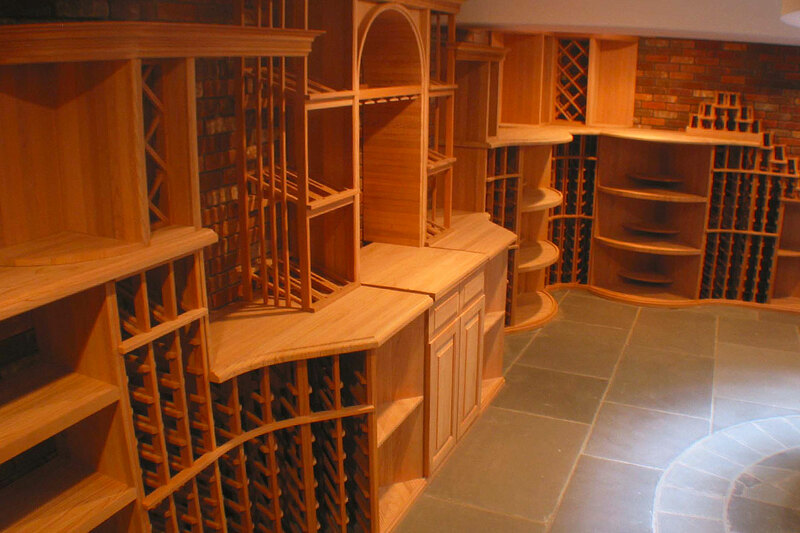 In Wellesley a dramatic look was achieved by mimicking the wine barrel curves with the shelves, counter radius, and the arch. 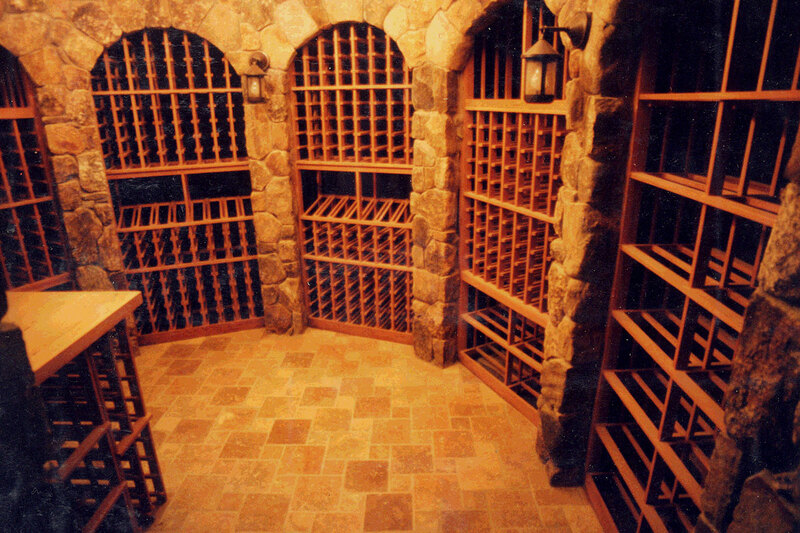 This homeowner had very definite ideas in a contemporary vein about what his wine cellar should look like. He was very pleased with the results. 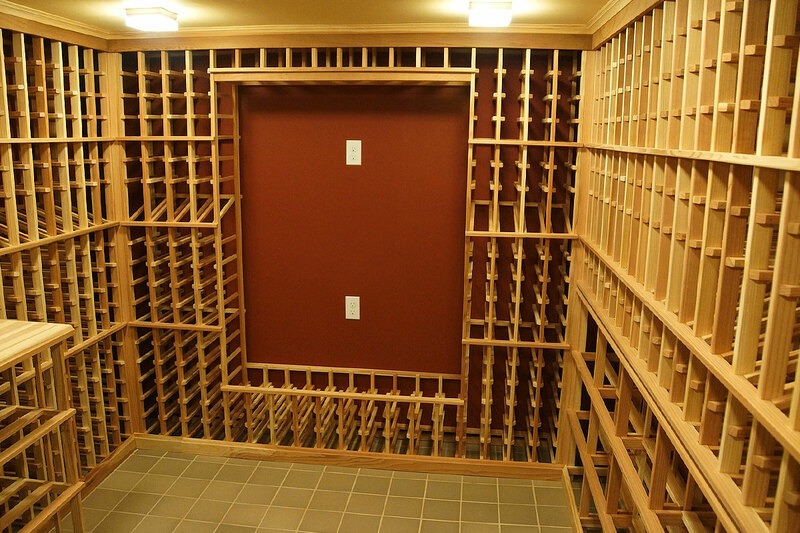 We managed to fit 800 bottles in this narrow Mattapoisett vacation home wine cellar. 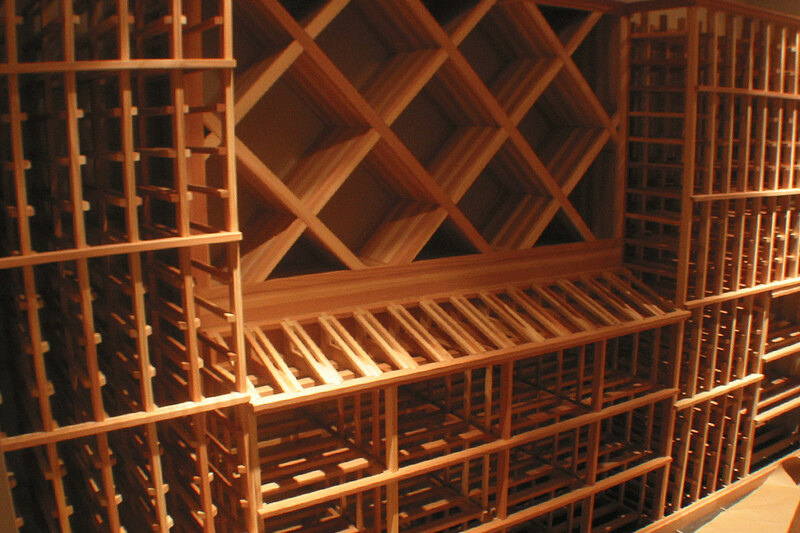 Angled corners and soffits provide a frame for wall art, and space to hide air ducts for the climate control system. 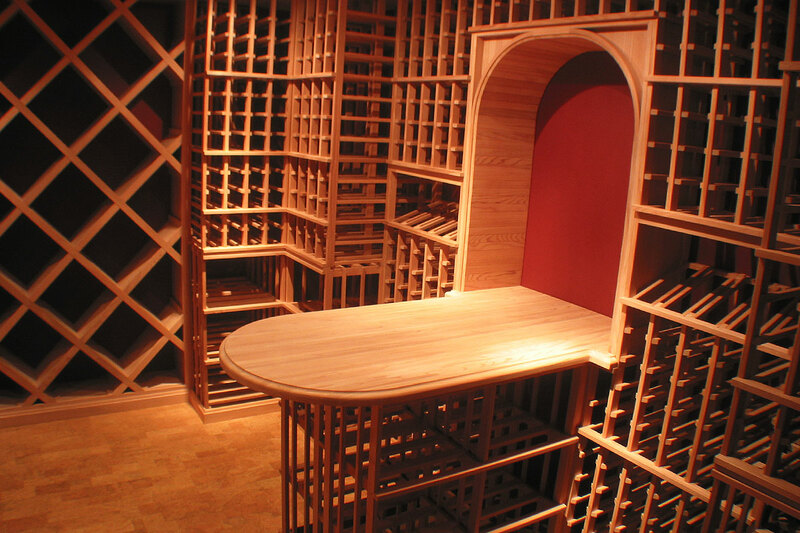 Minimalist design and a large tasting table, the top yet to be installed. 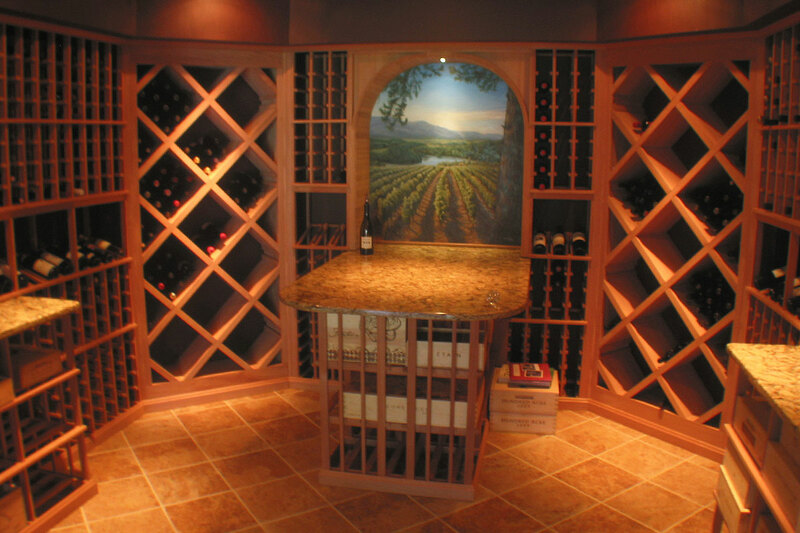 An elegant wine cellar design with a Dyrick Schaefer oil on canvas painting in the arch. It is our most requested design to be emulated. 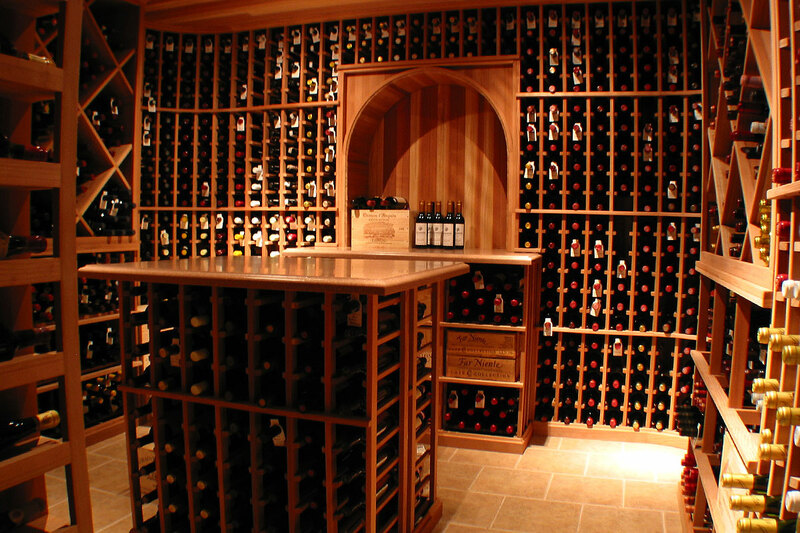 With a walk through wine racks arch this cellar holds 4,000 bottles but was full on its first day. 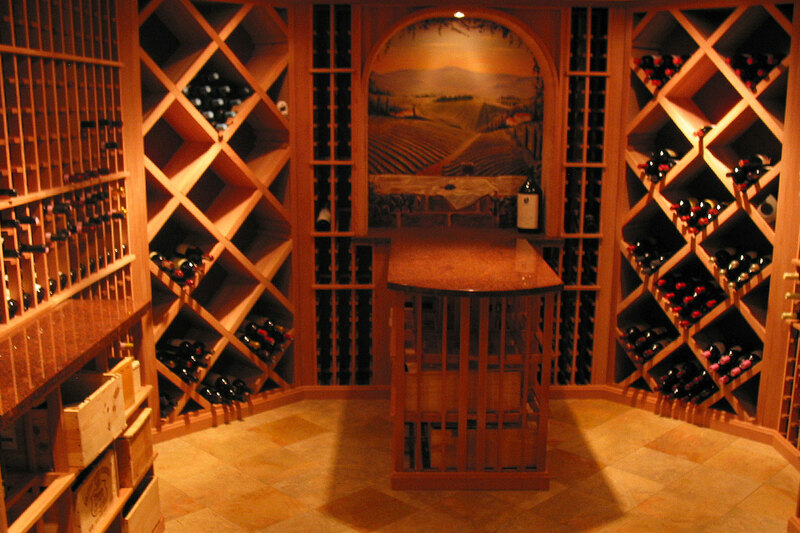 Another Dyrick Schaefer oil on canvas in a wine cellar with lovely true radius curved corners. Countertops yet to be installed. 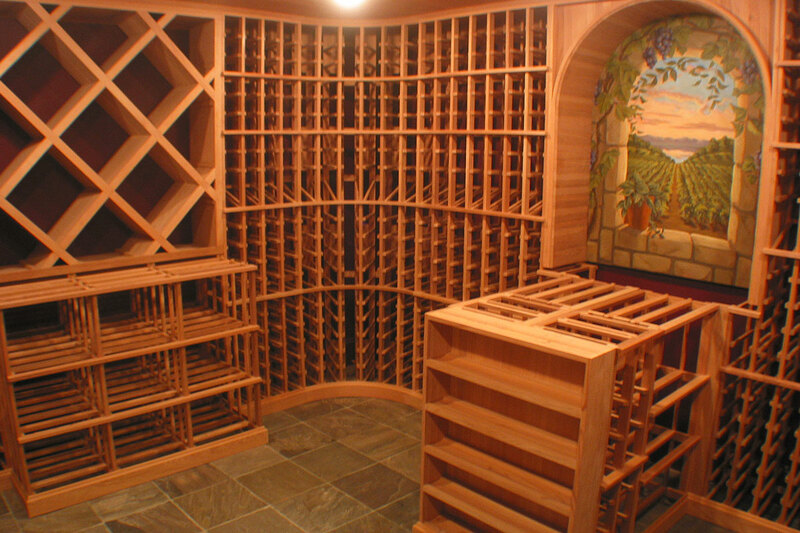 The homeowner’s brother painted this beautiful vineyard scene. 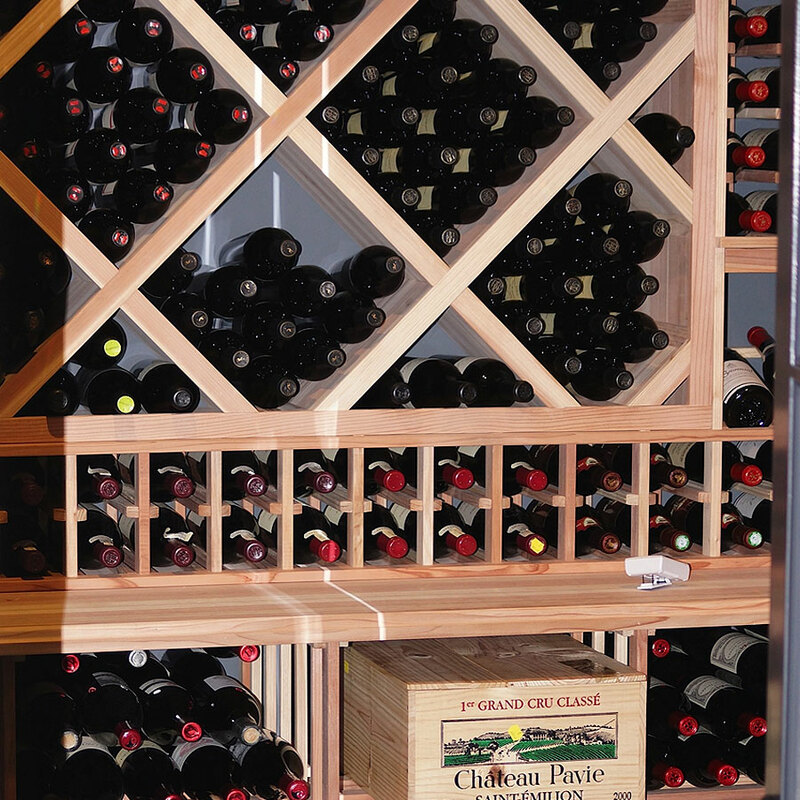 Open top display racks show the full bottle label in a space that usually has a countertop. 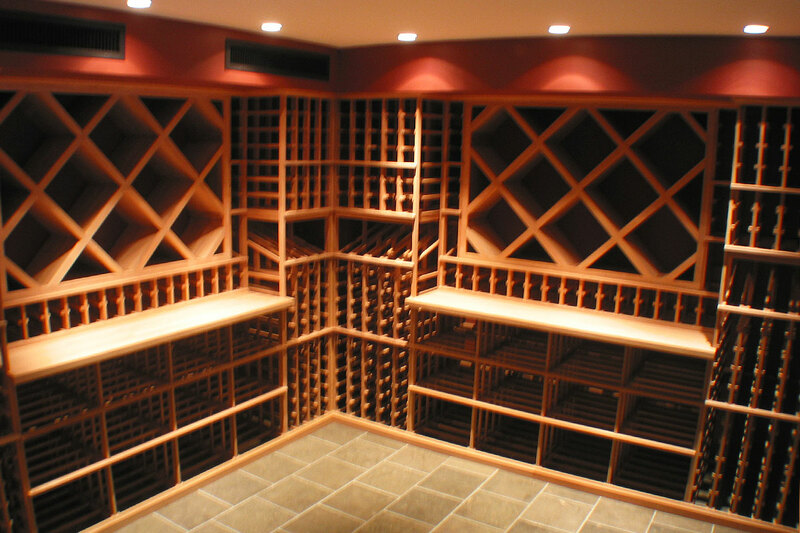 Wine racks always look great under perimeter soffits. 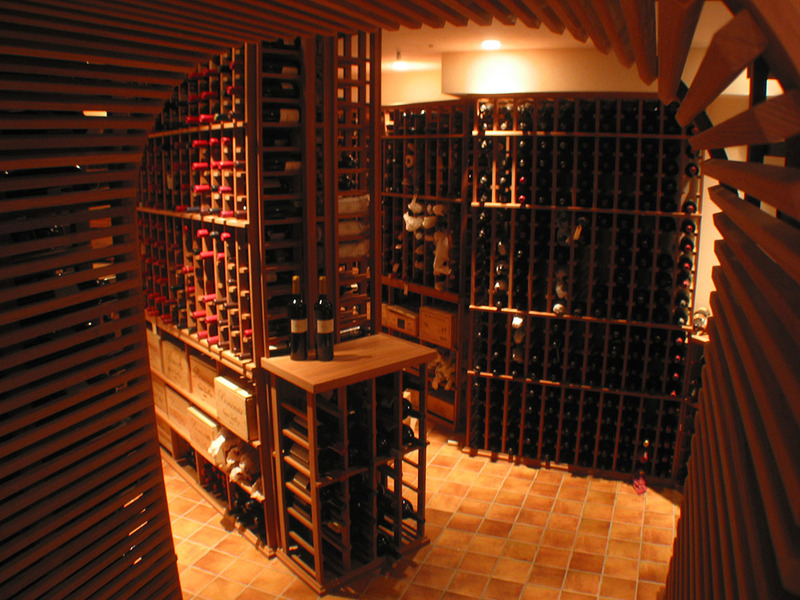 An unusual main floor wine cellar in Back Bay an area that always presents cooling system challenges. 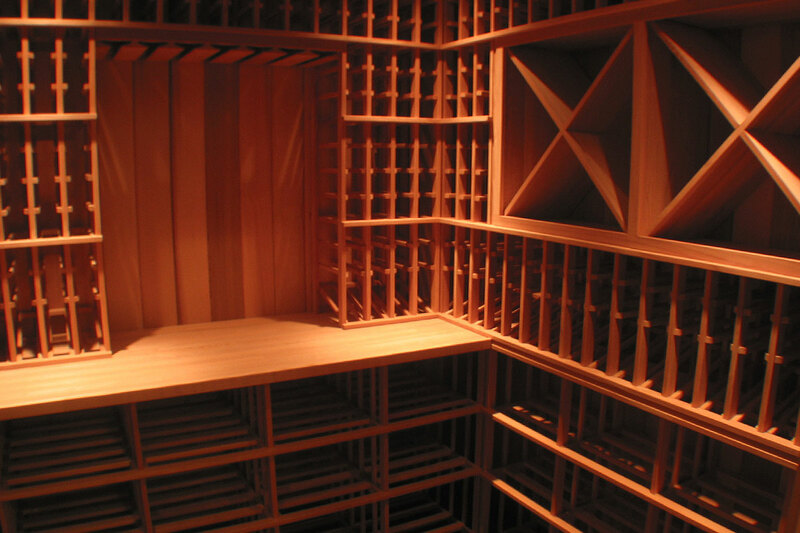 This area of the wine racks was specifically sized for a painting with light above. 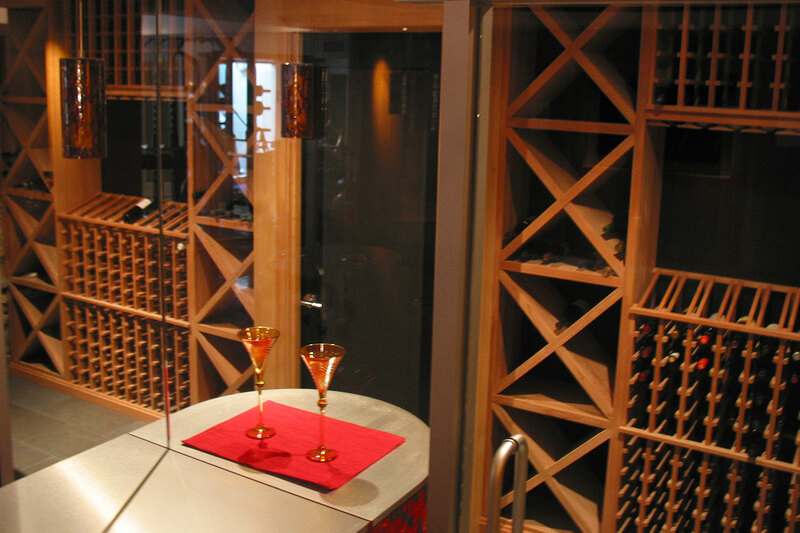 A glass wall wine cellar behind the bar. 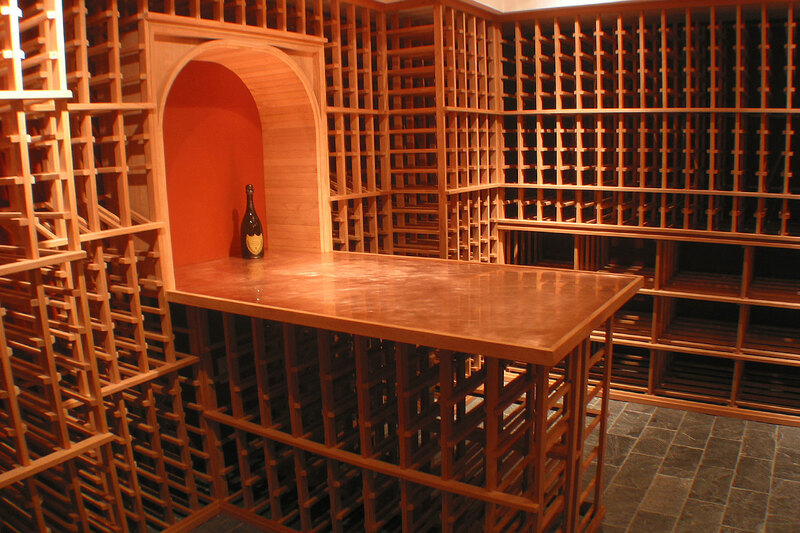 Large tasting table without a countertop. Dyrick did a great job of painting this customer’s father and mother into the vineyard scene, it was a hit with the family. 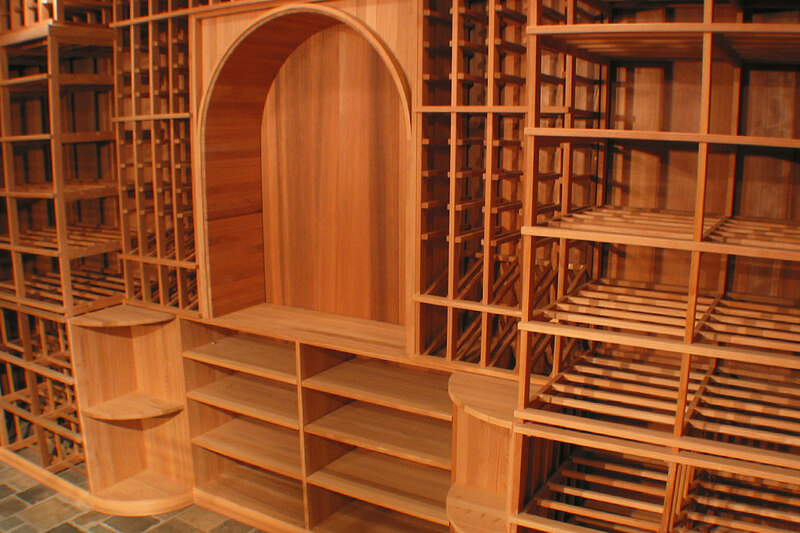 The wood cases stored in these wine racks can also hold bottles.